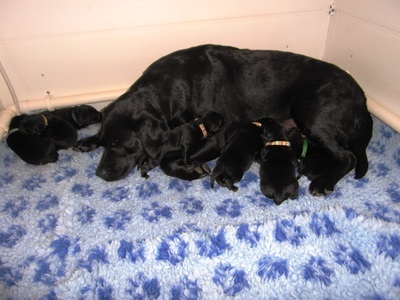 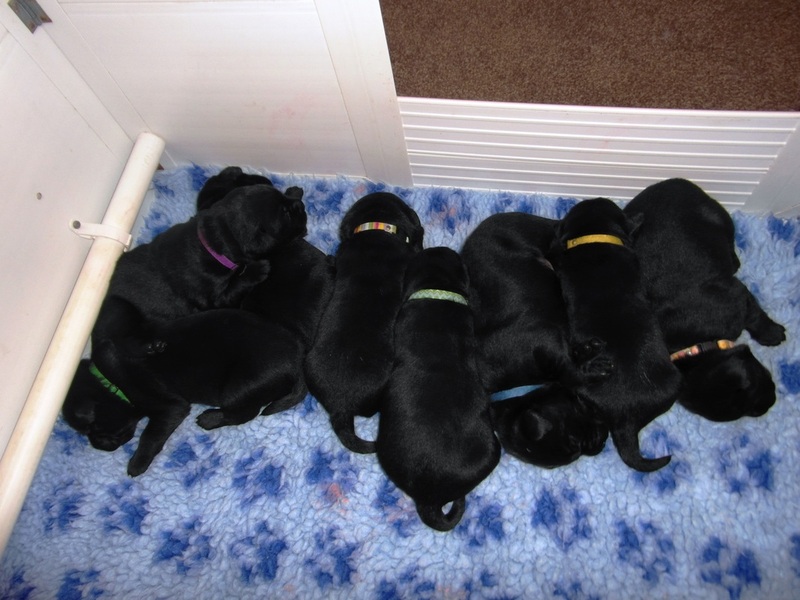 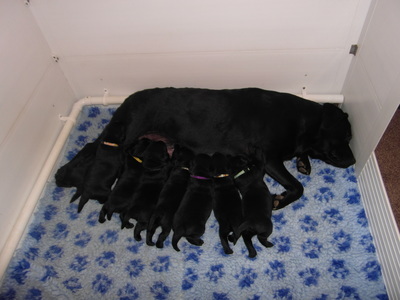 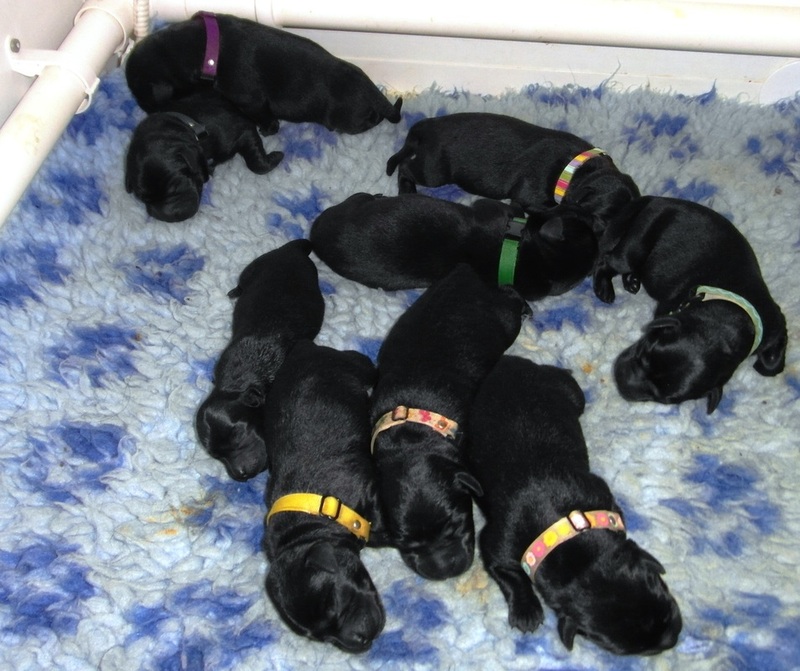 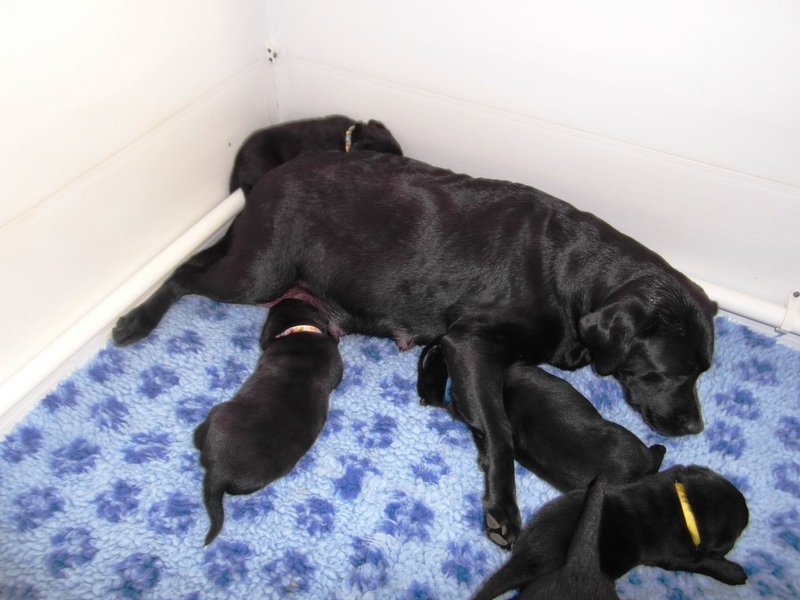 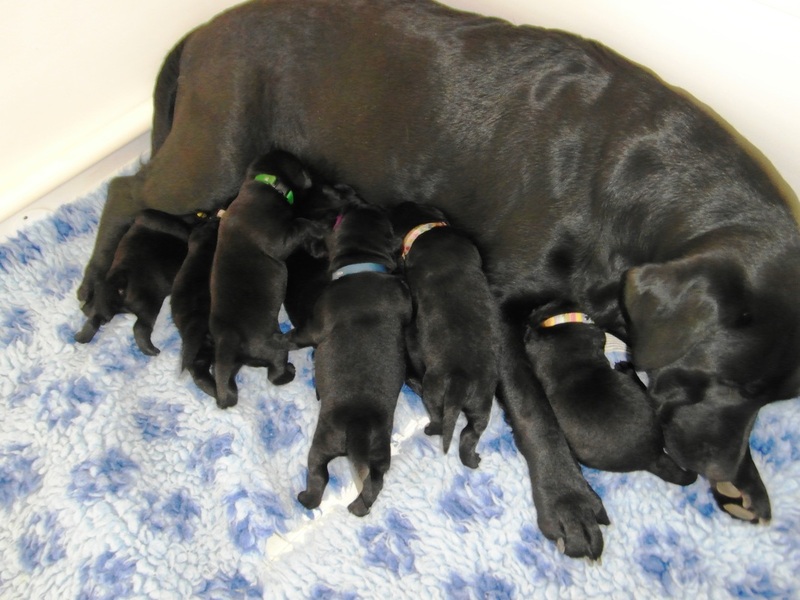 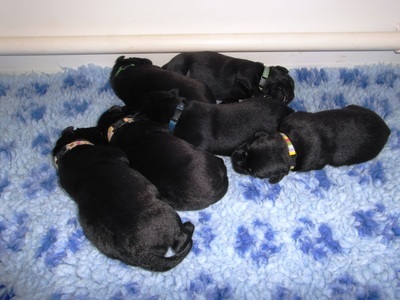 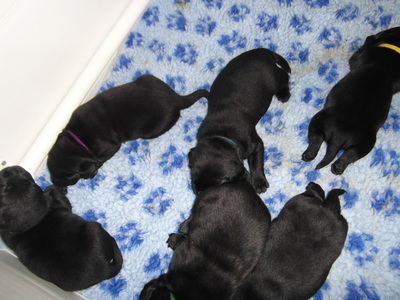 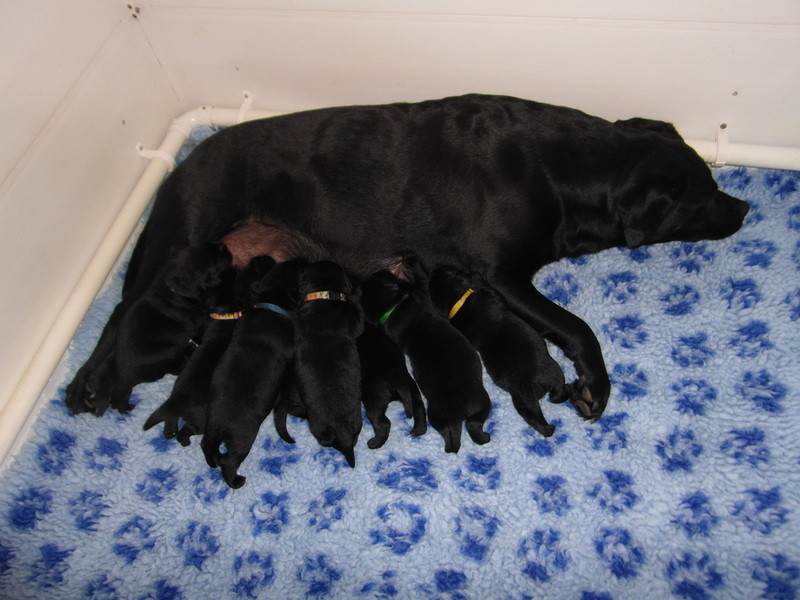 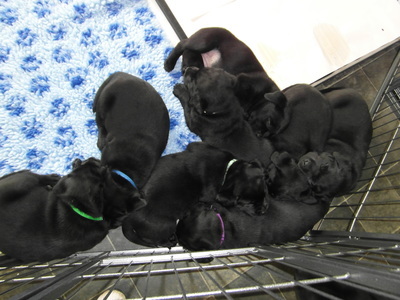 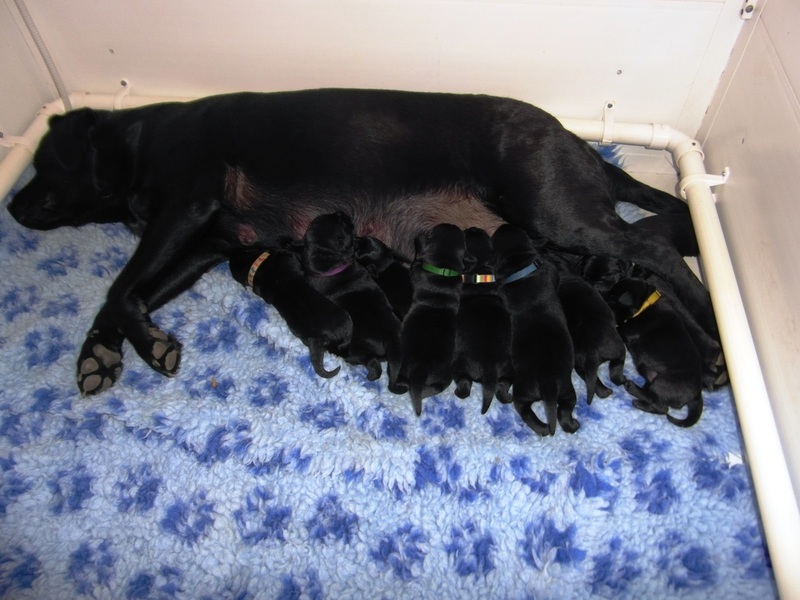 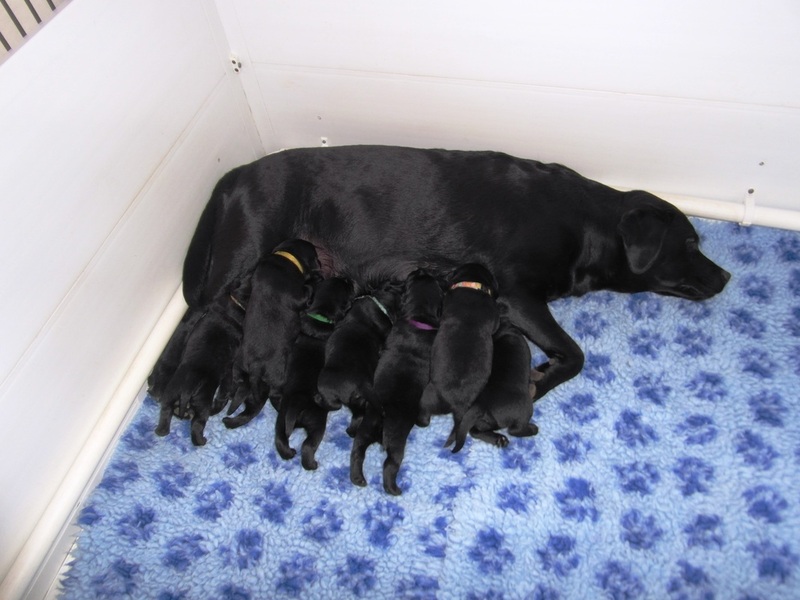 One of the first photos of Gertie and her puppies, 3 boys and 6 girls. 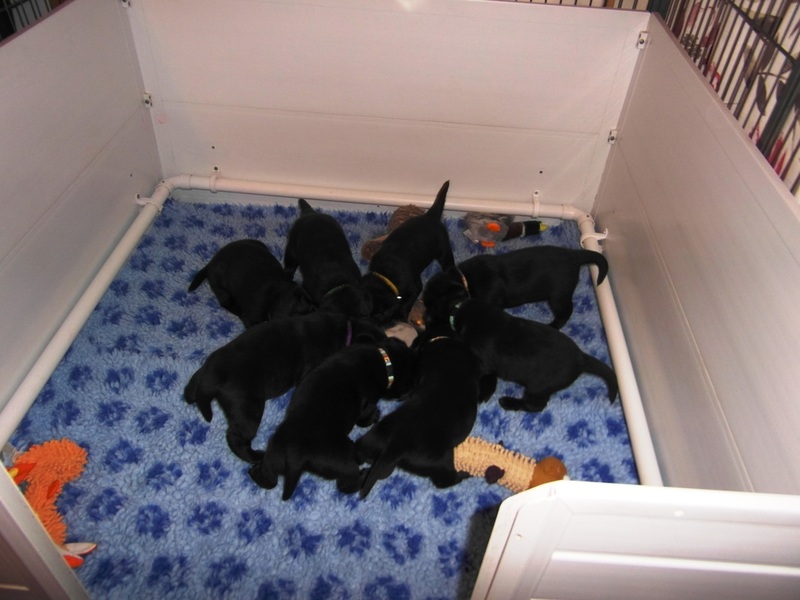 The puppies on their own. The little tot with no collar is too small to safely wear an ID collar at the moment, but should soon be big enough. 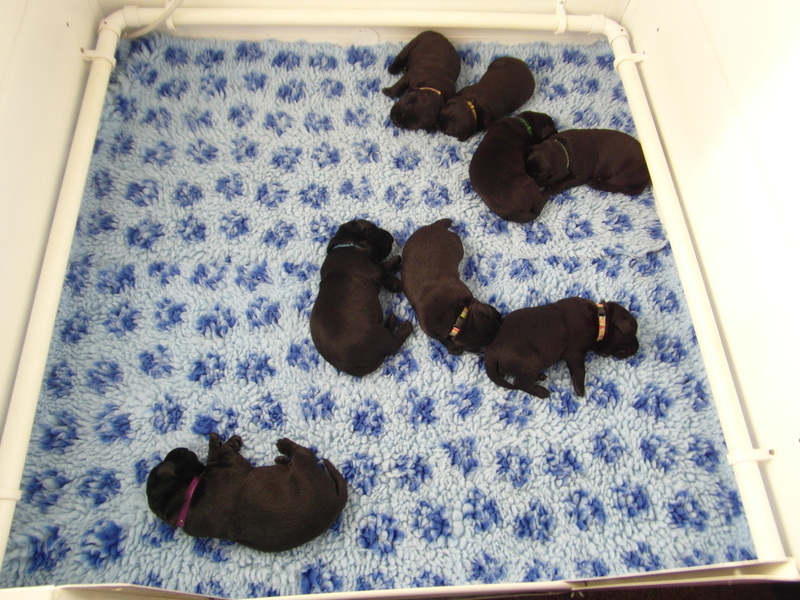 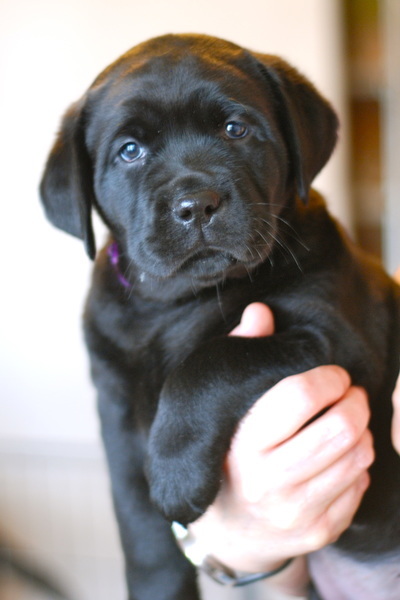 The first VIDEO of Gertie and the puppies. 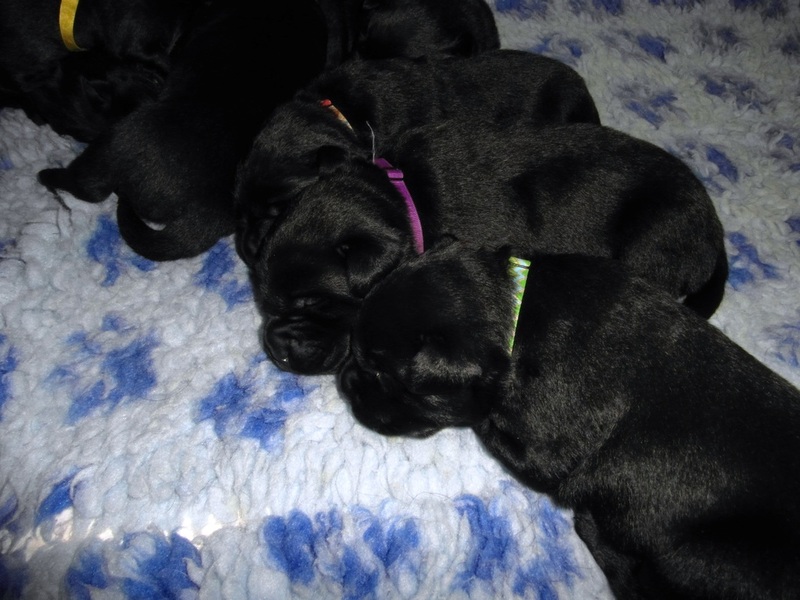 It's rather dark but I think you can get a view of them. 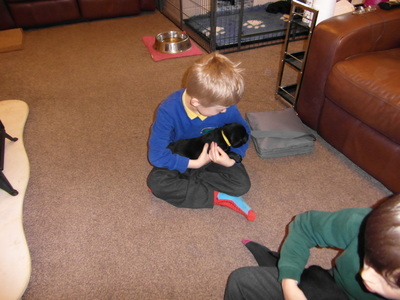 The puppies have had visits from some of my grandchildren today. 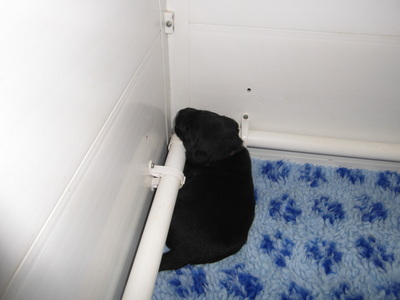 Here's 3 year old Isla joining the puppies in the whelping box. 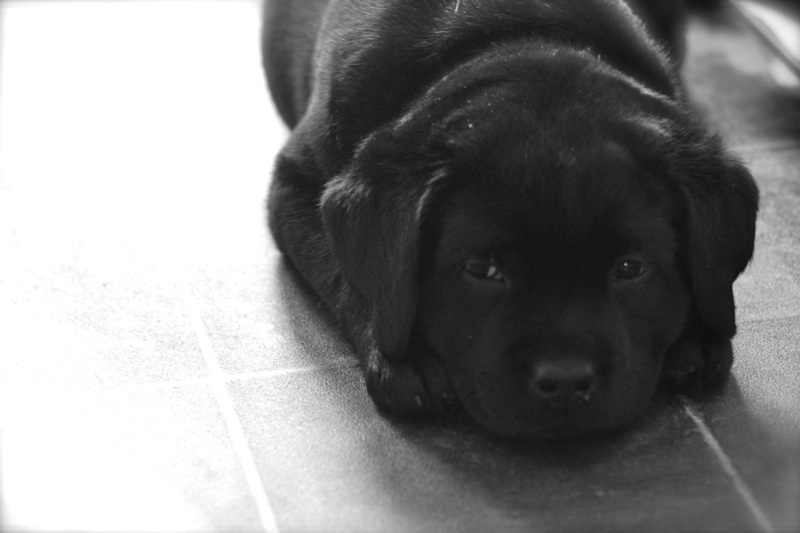 A sad day. At 2 o'clock this morning Gertie's tiniest girl fell asleep forever. 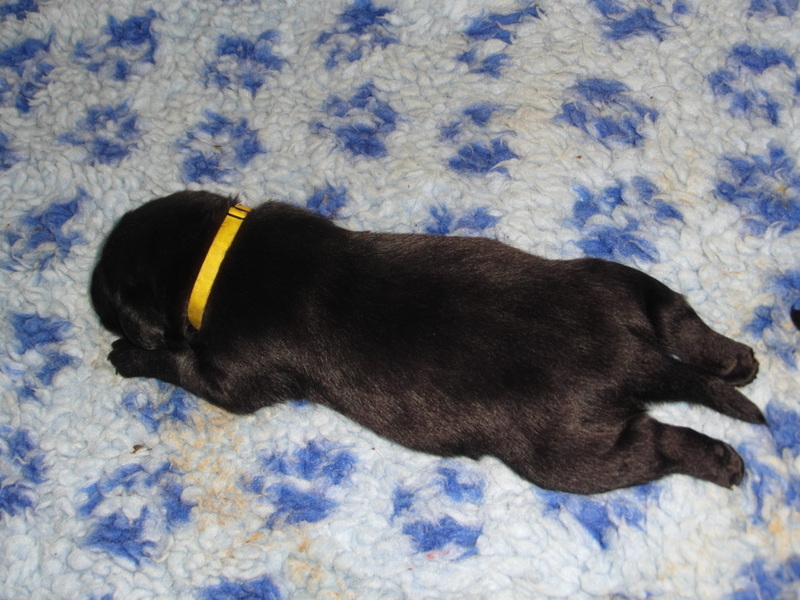 I'd struggled to put some weight on her, despite supplementing feeds and last night she went downhill very quickly. She wouldn't have the milk I offered her, nor would she feed off Gertie. 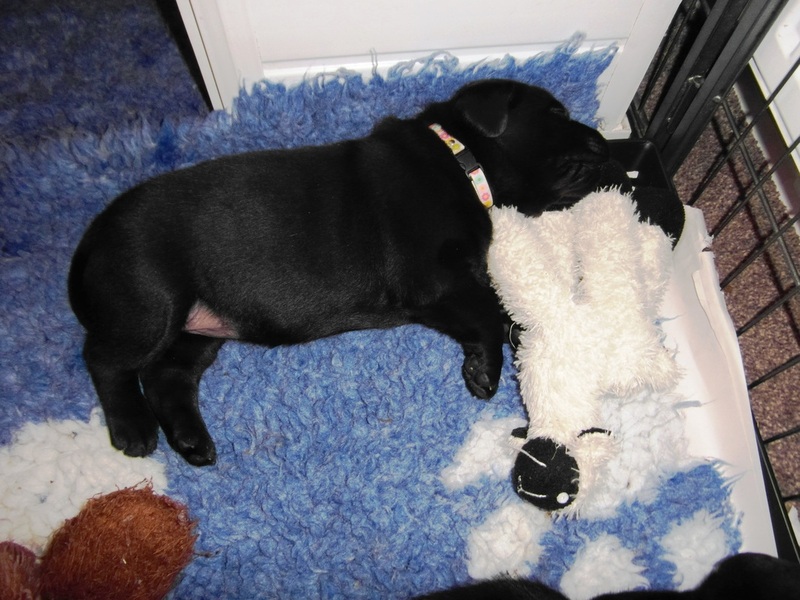 I cuddled her to me, snuggled in my fleece to keep her warm and hoping that she knew how much I loved her. All lined up at the milk bar. 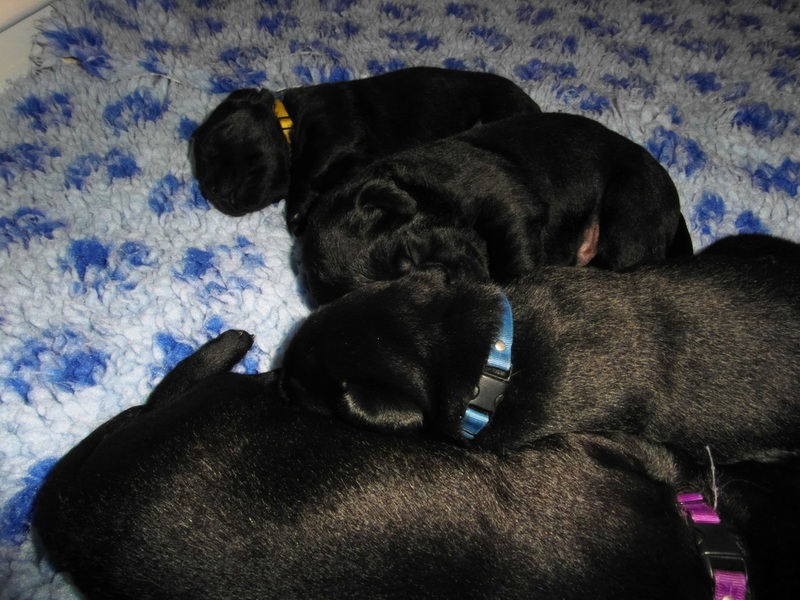 The puppies' eyes are starting to open so I'll need to make sure that I don't use the camera flash when taking photos in the next few days. 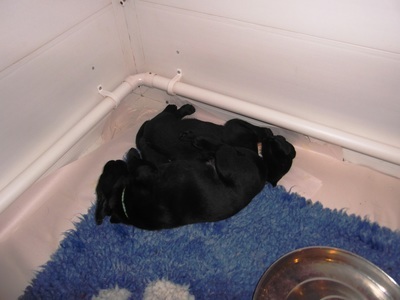 Three of the girls and one of the boys, snuggling together in the corner of the whelping box. The little guy near the back is asleep with his tongue out. 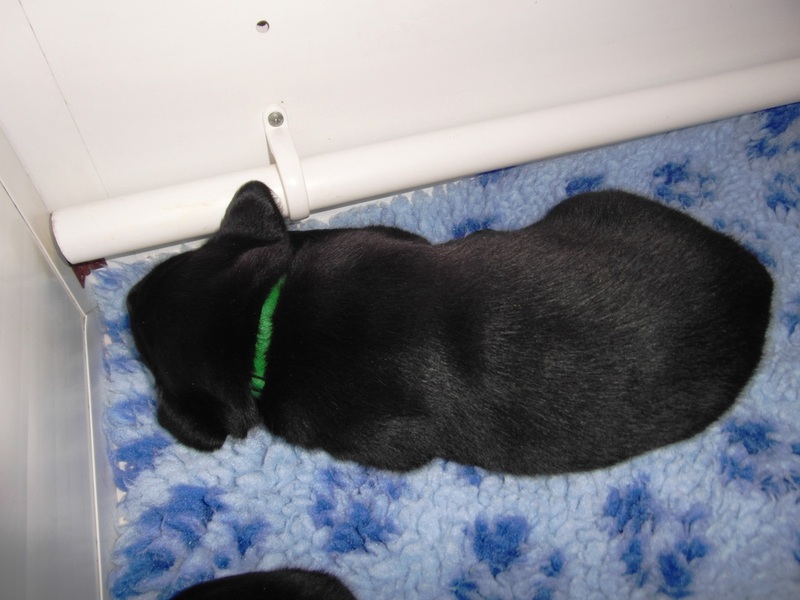 Another little tongue peeping out. 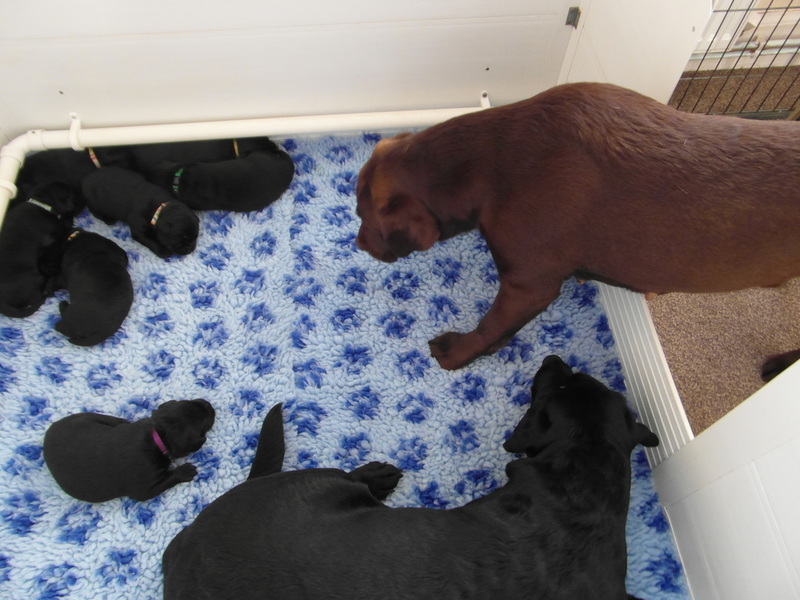 Look who sneaked in to have a look at the pups - Annie, caught in the act. 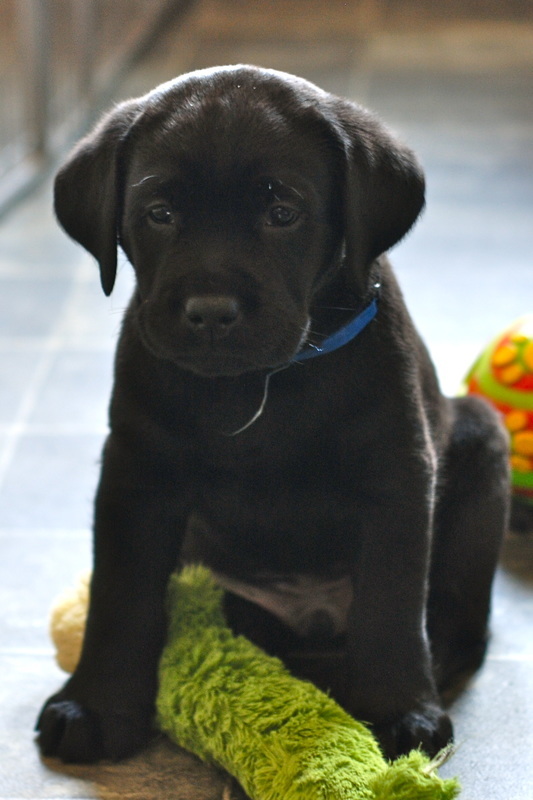 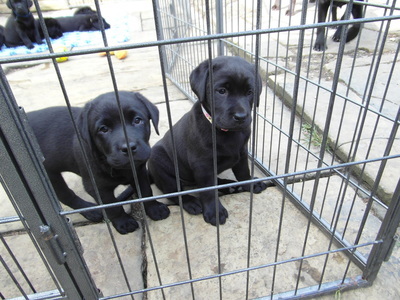 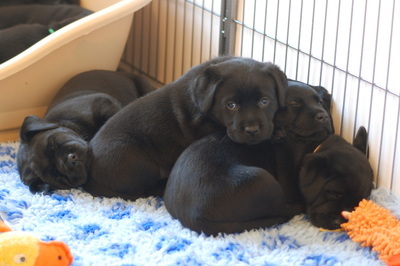 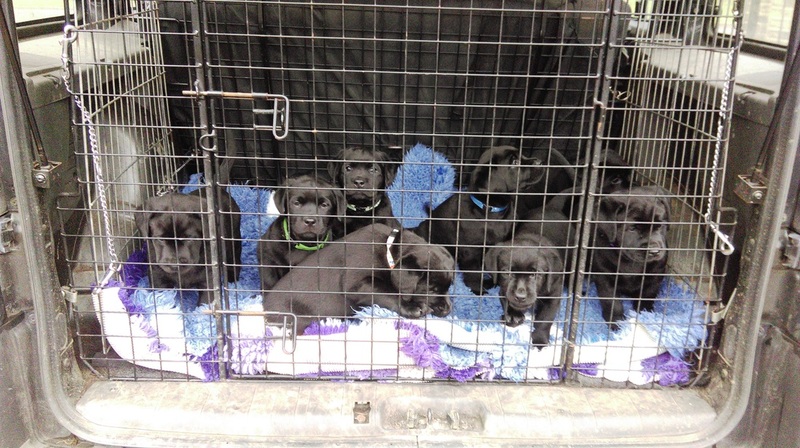 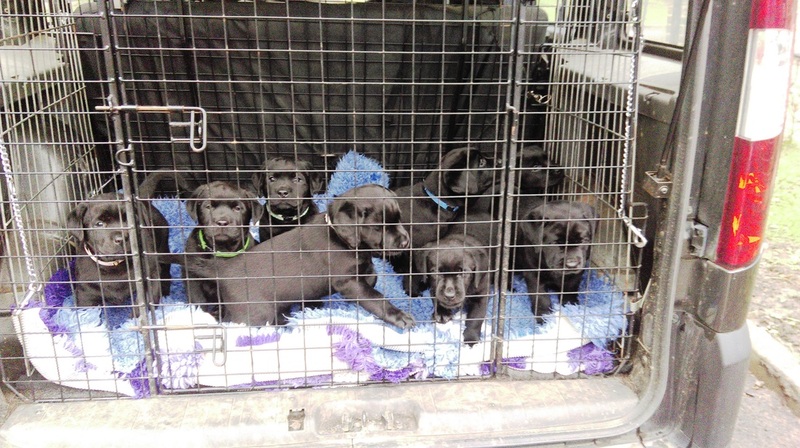 The Labrador puppy formation team. 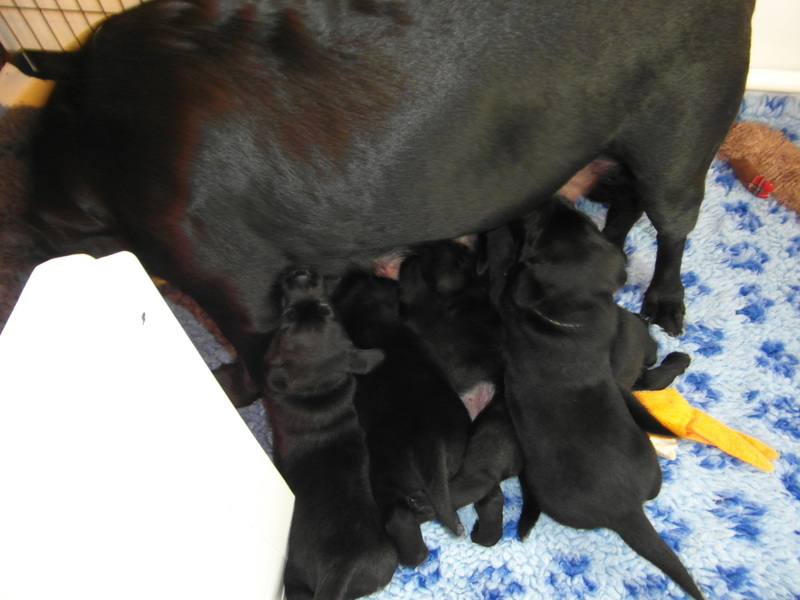 Today has been weighing and worming day. 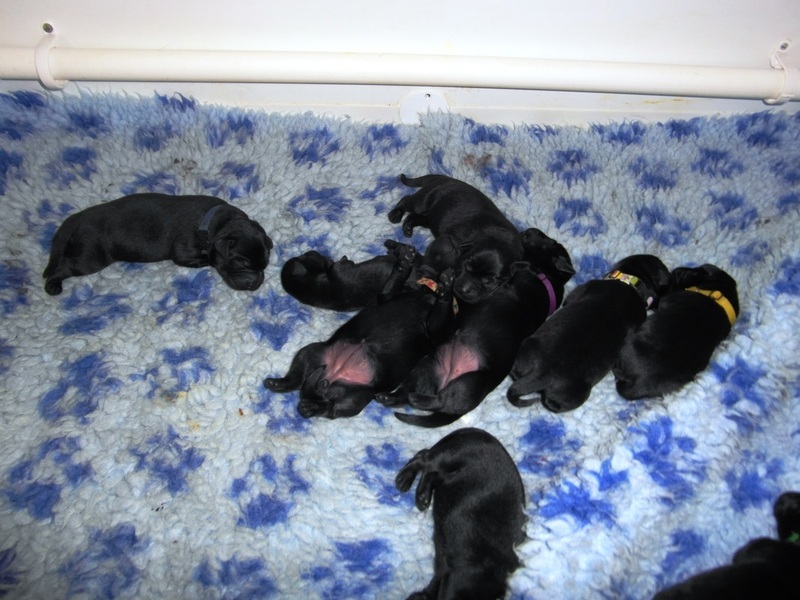 All of the puppies have more than trebled their birth weight. 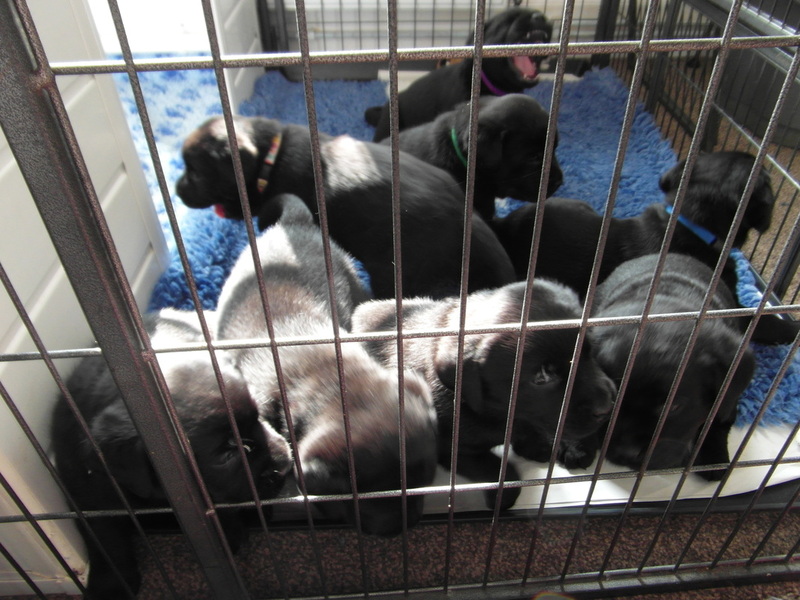 They were most unimpressed by the worming liquid and I think I ended up with more on my fingers than they did in their mouths. 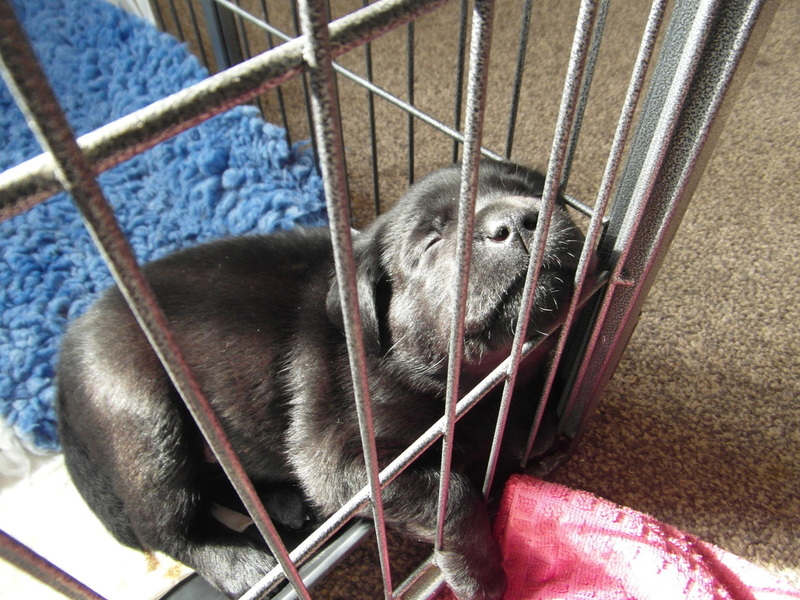 More snoozing. 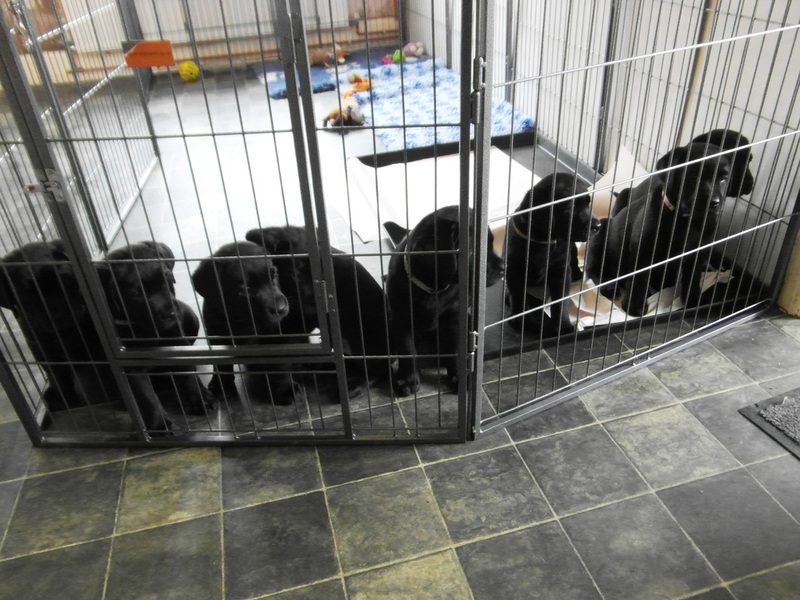 The puppies look more chocolate than black in these photos but it's just a trick of the light. The puppies will be starting on solid food in a couple of days' time and judging by the way they've tucked in to their first taste of goats' milk I don't think there'll be any problems. 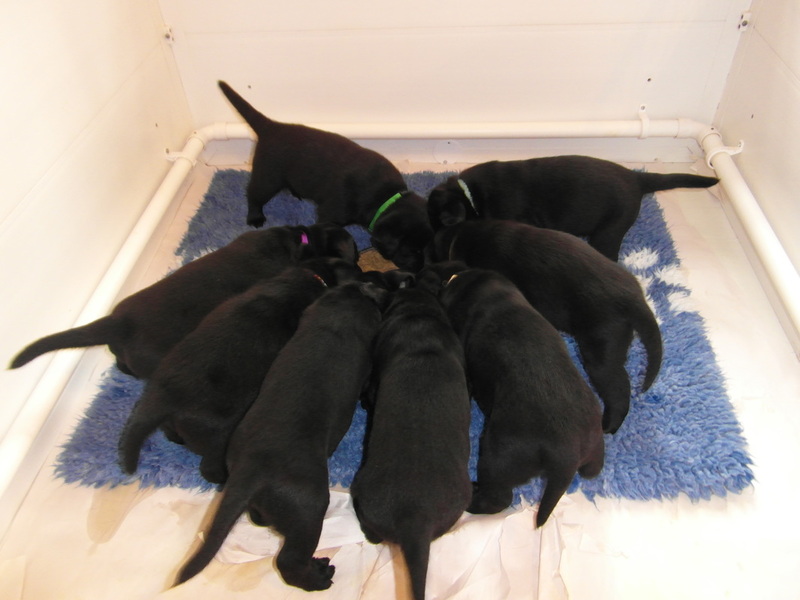 Turn up the volume when you watch this VIDEO so you can hear as well as see the puppies tucking into their food. 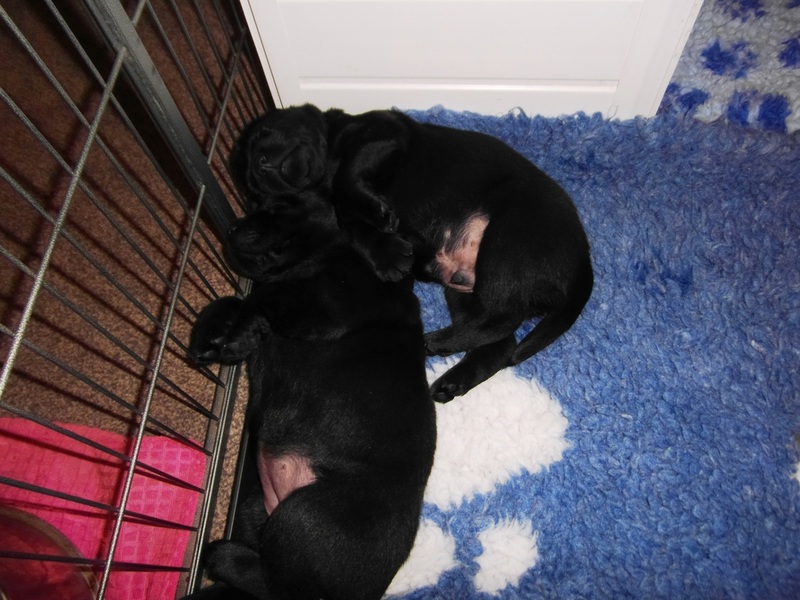 The puppies sleep in some of the most awkward positions and you wouldn't think they could possibly be comfortable. 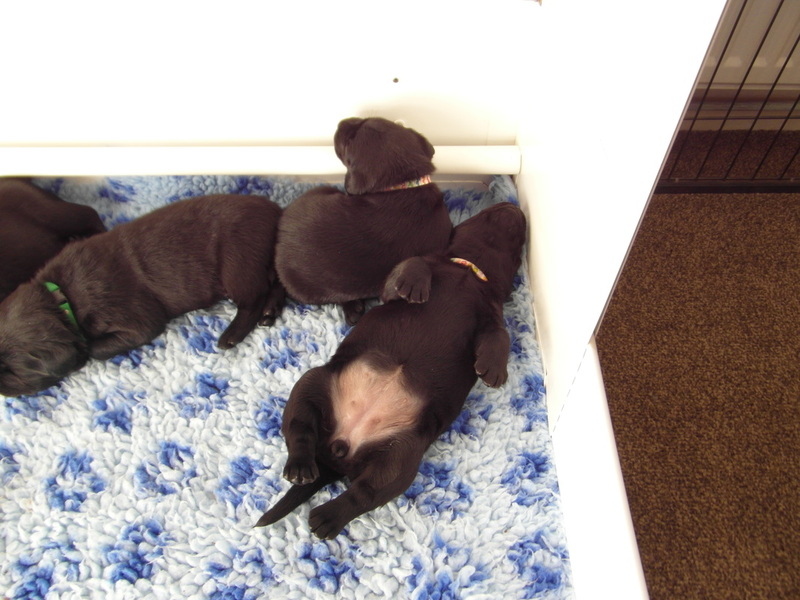 Some of the more chilled positions. It's been a busy day for the puppies, with the first of their new families coming to visit for the first time. 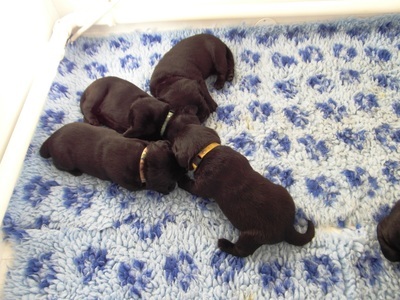 They'll have more visitors tomorrow, with the final two families coming next weekend. 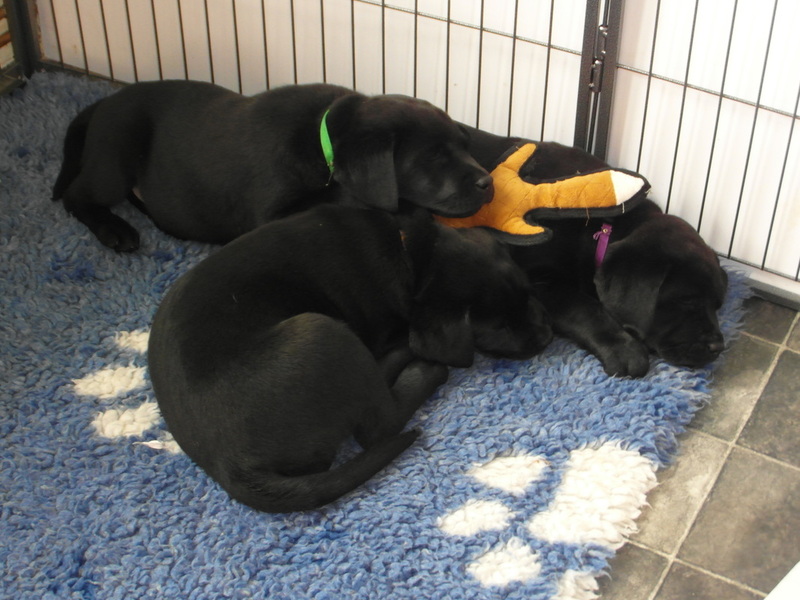 Another busy day for the puppies, with more of their new families coming to visit. 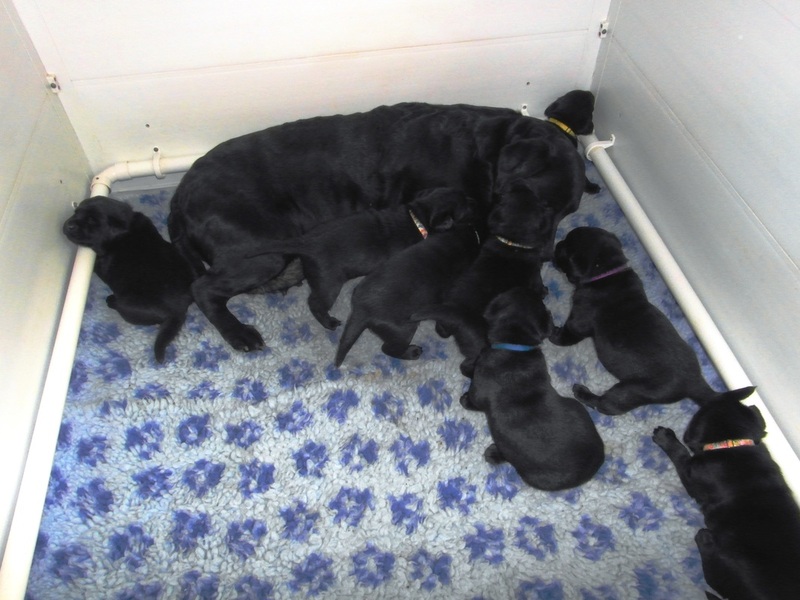 In this FIRST video you can watch the puppies' reaction to their granny, Martha. 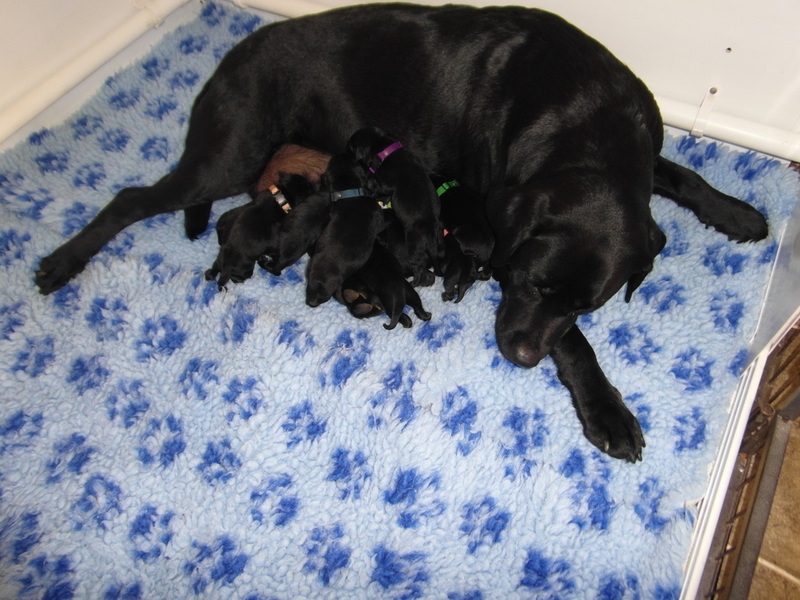 In the second, very short, VIDEO you can see Annie is already in with the puppies when great granny Poppy gets in. 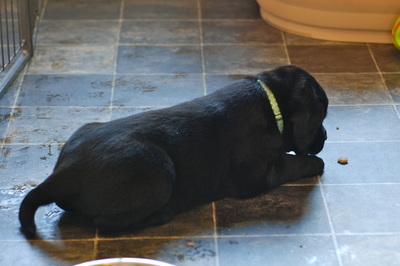 Cheeky Poppy growls to warn everyone else to stay out. 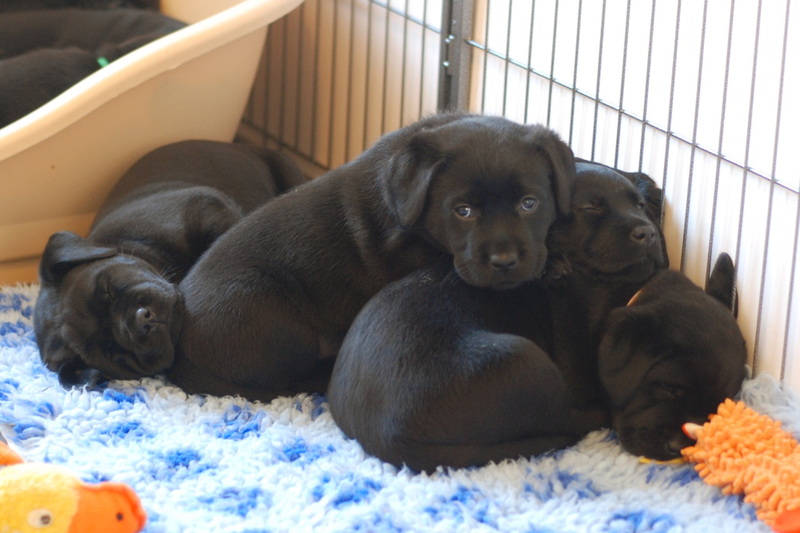 ​Look who I caught in with the puppies earlier on - Poppy. 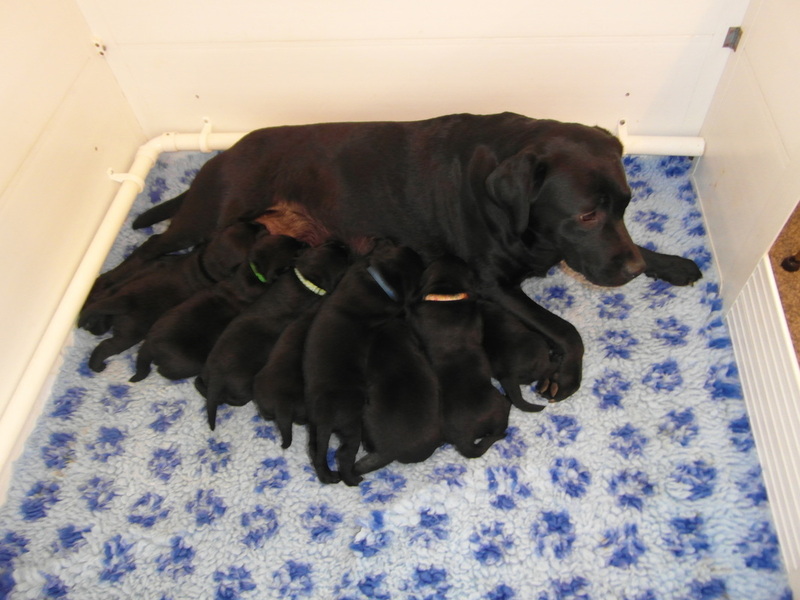 She was making herself known to the puppies for the very first time. 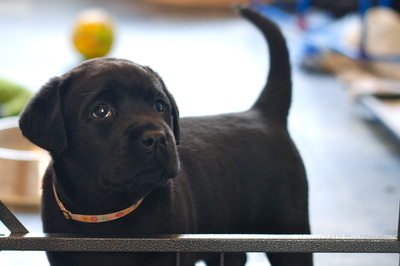 As you saw in the later video, there's no keeping her out now. 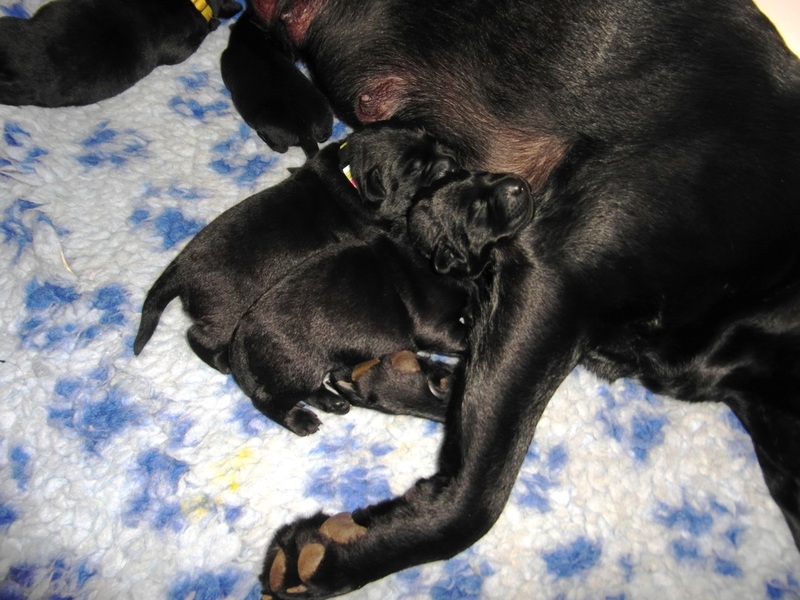 The pups are all gathering great granny Pops. 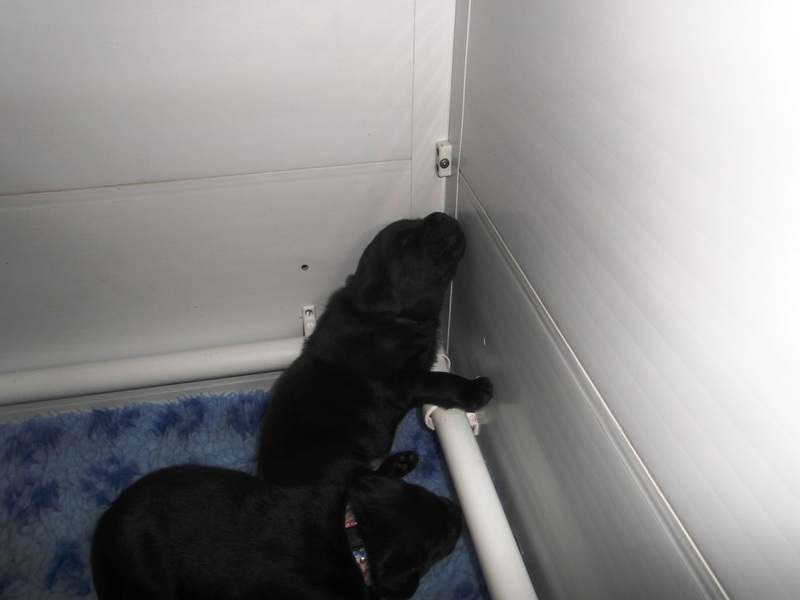 I can't keep her out! 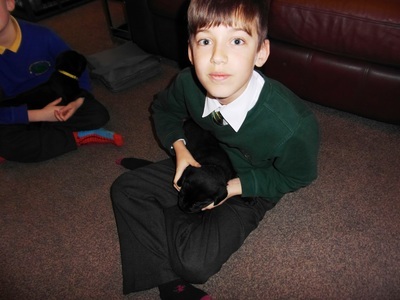 My grandsons, Owen and Luca, couldn't resist puppy cuddles after school today. 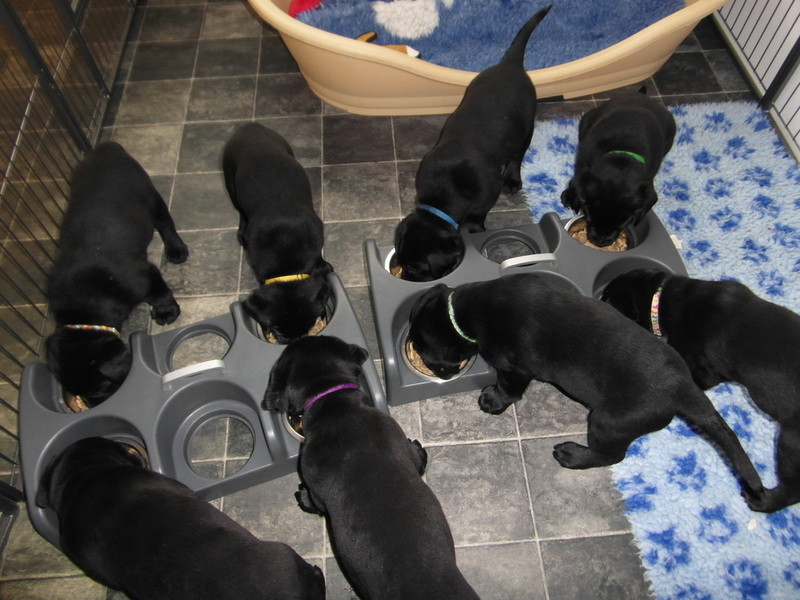 Another mealtime. The puppies are on 4 meals a day now, the disadvantage of that is that what goes in one end, comes out of the other! 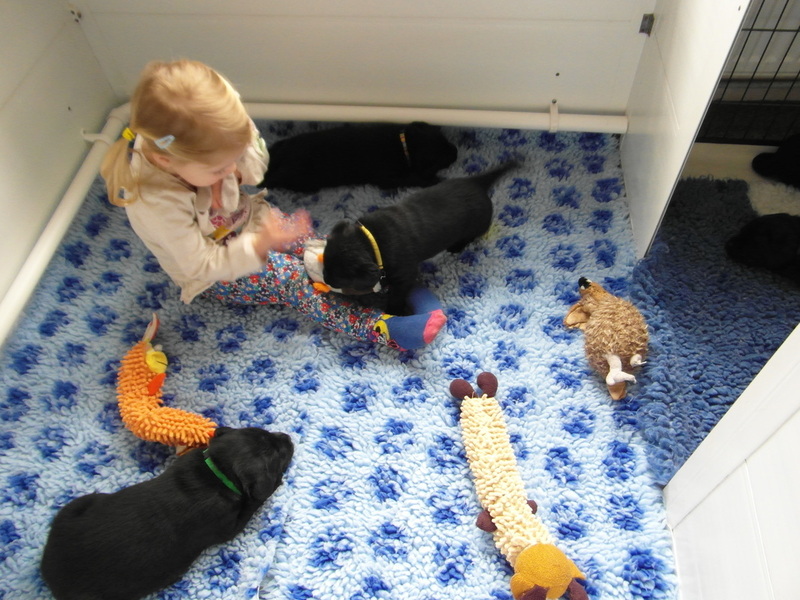 Isla and the girl with the yellow puppy have had fun playing together today. 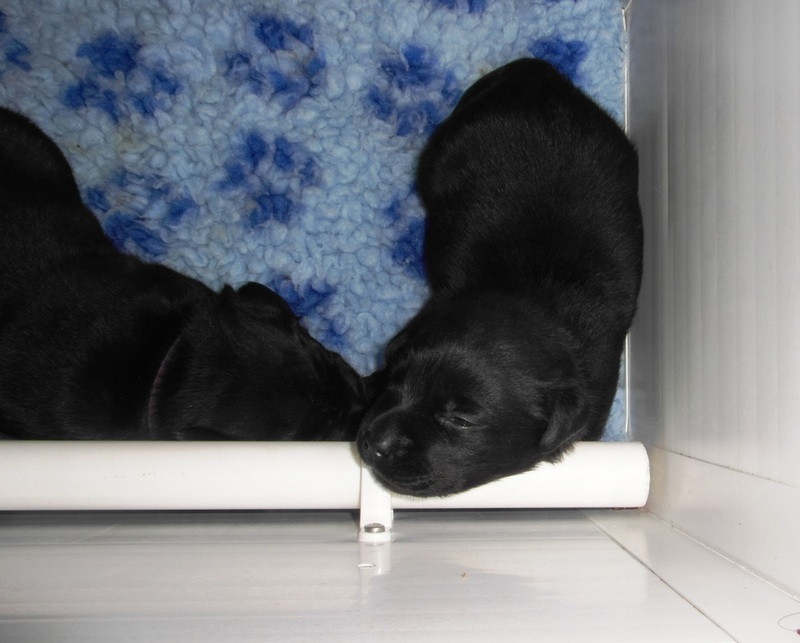 I've extended the puppies' play area and they seem to prefer to sleep outside the whelping box. 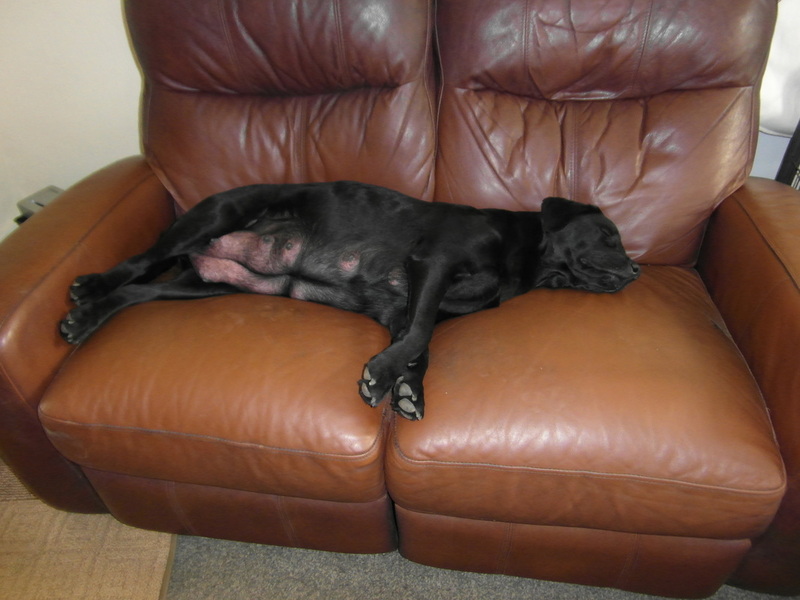 Meanwhile, Gertie takes the opportunity to have a snooze on the sofa. 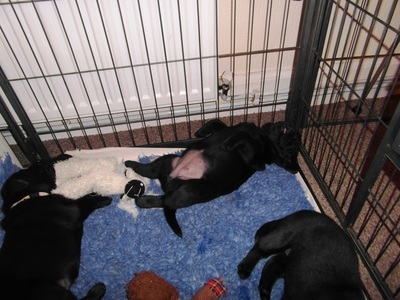 The puppies sleep in some strange positions. 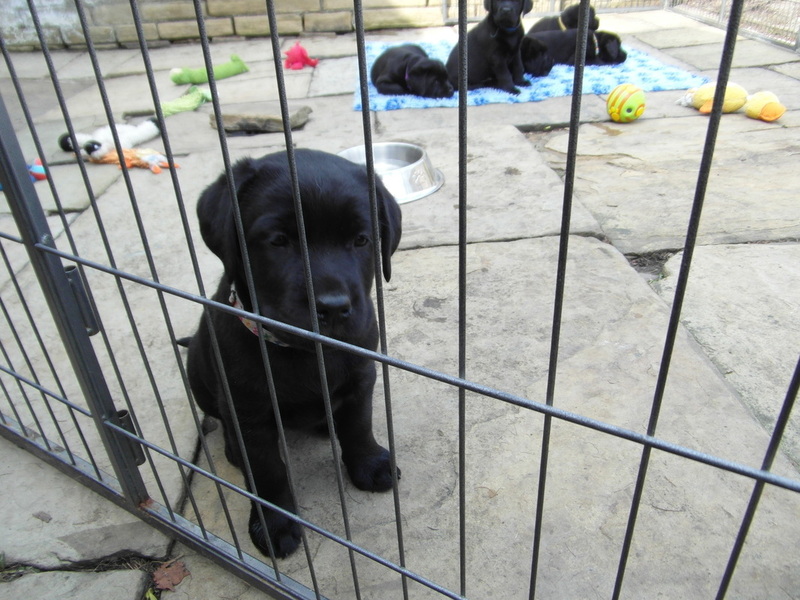 It's a lovely sunny day and puppies are keen to enjoy it by playing in the open part of the pen.Watch them in these 2 videos. VIDEO 1 and VIDEO 2 as well as the 2 photos below. 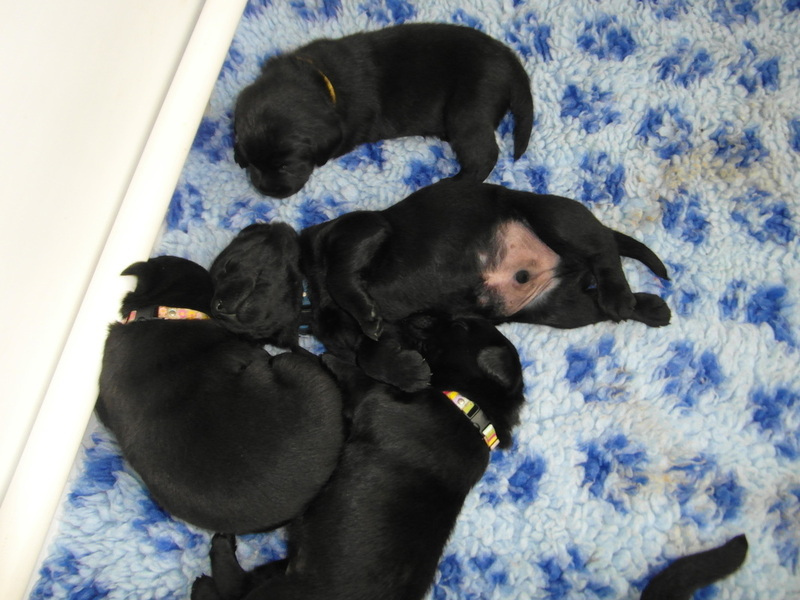 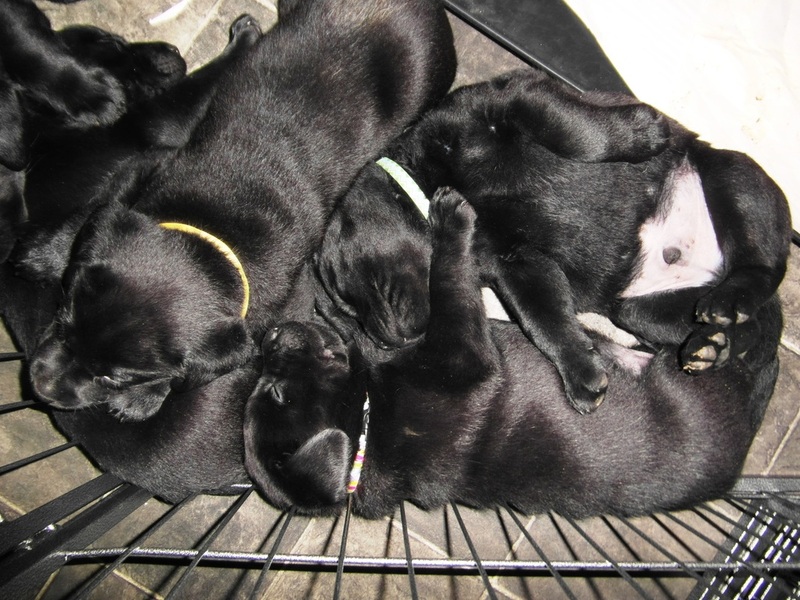 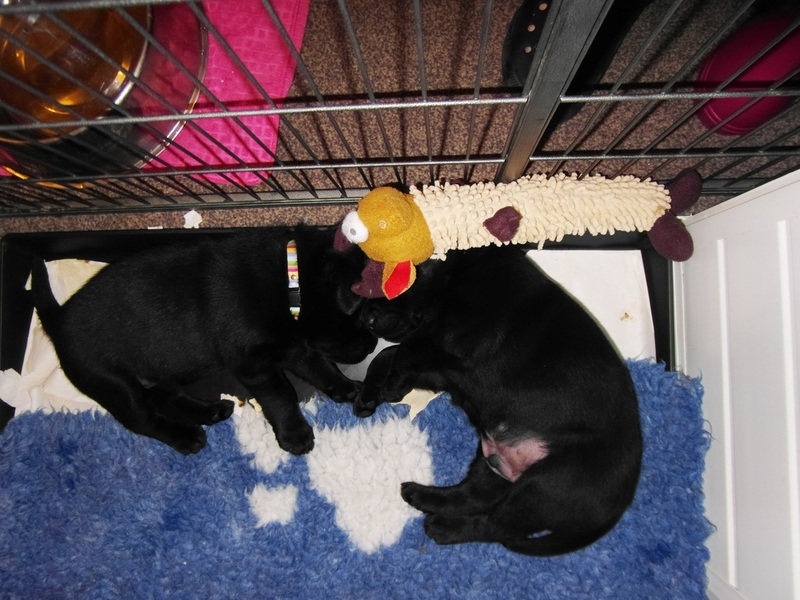 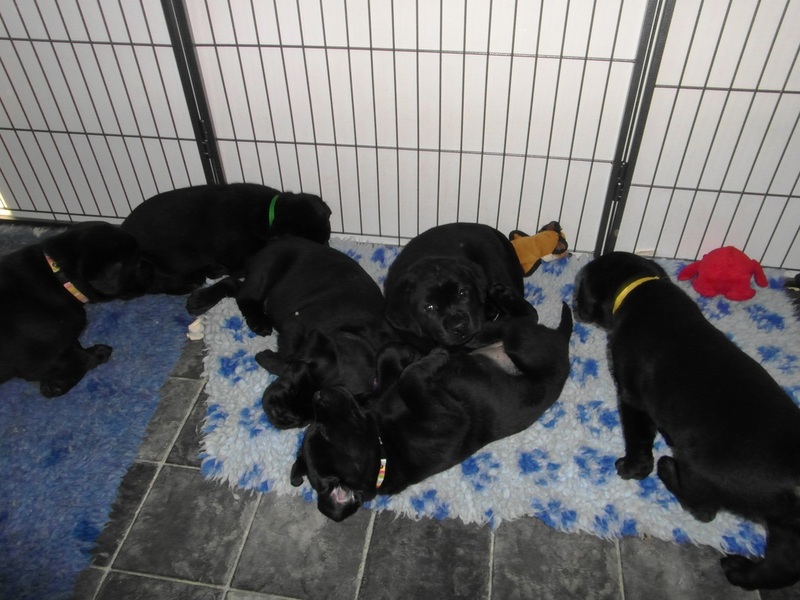 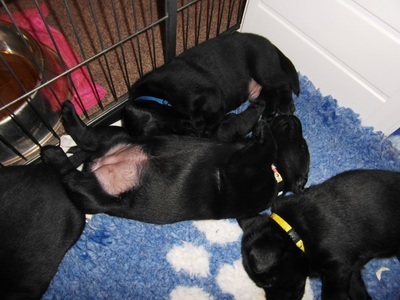 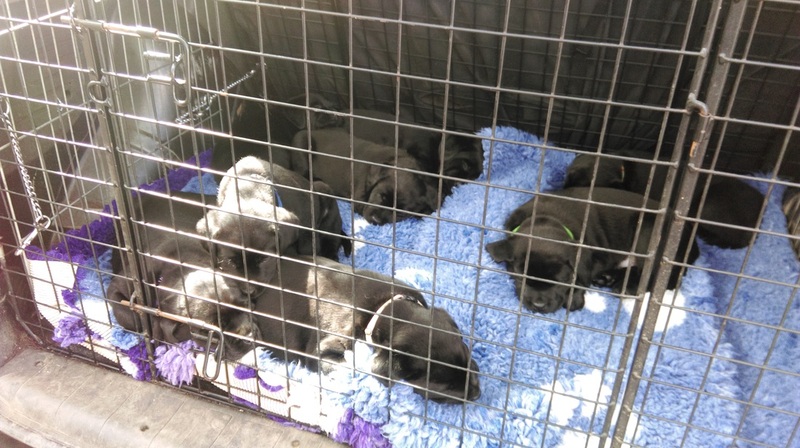 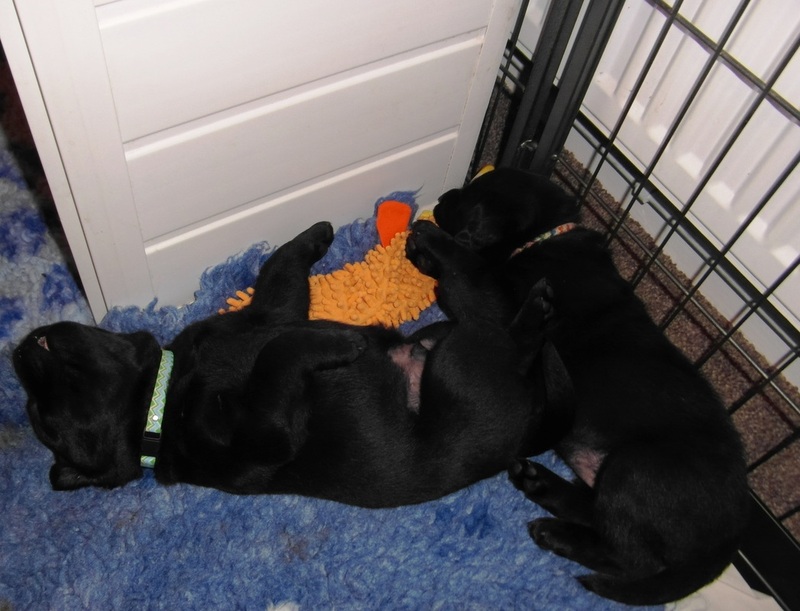 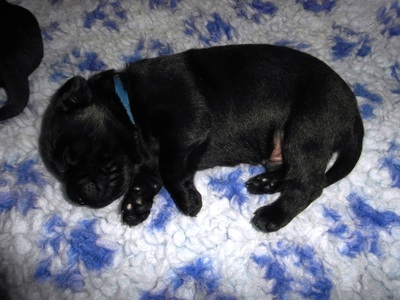 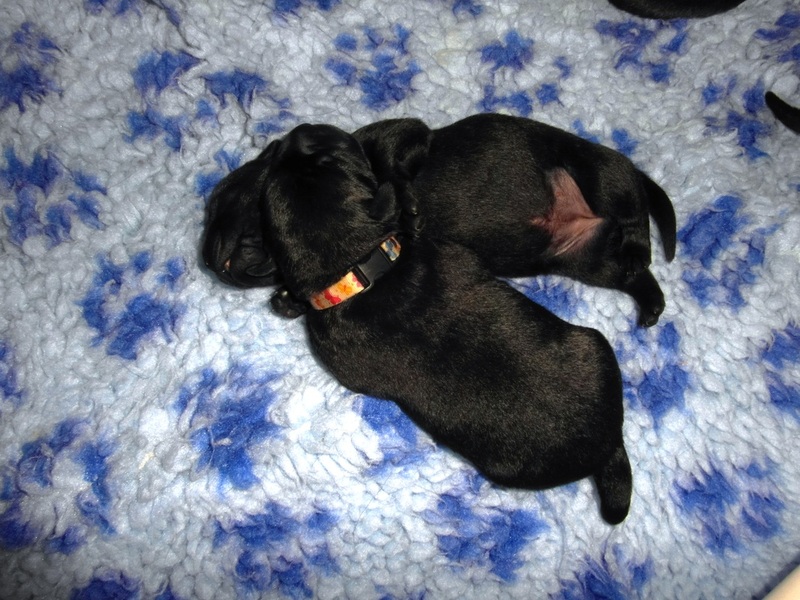 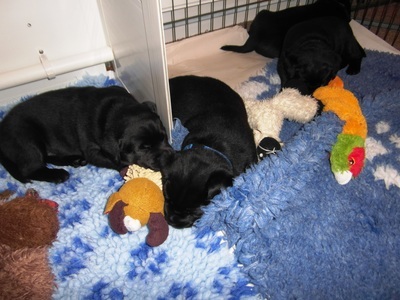 Some photos of the puppies, all pooped out, quite literally! 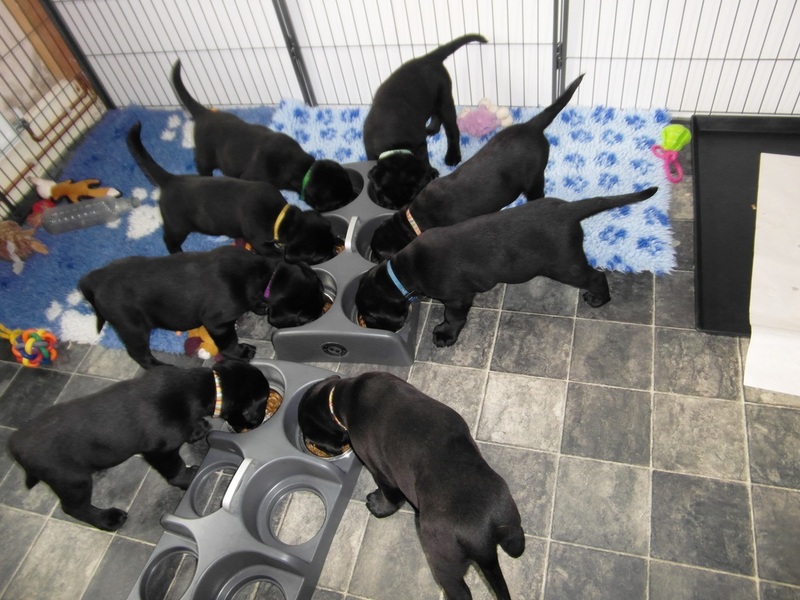 One of the downsides of weaning is that whatever goes in one end has to come out of the other. 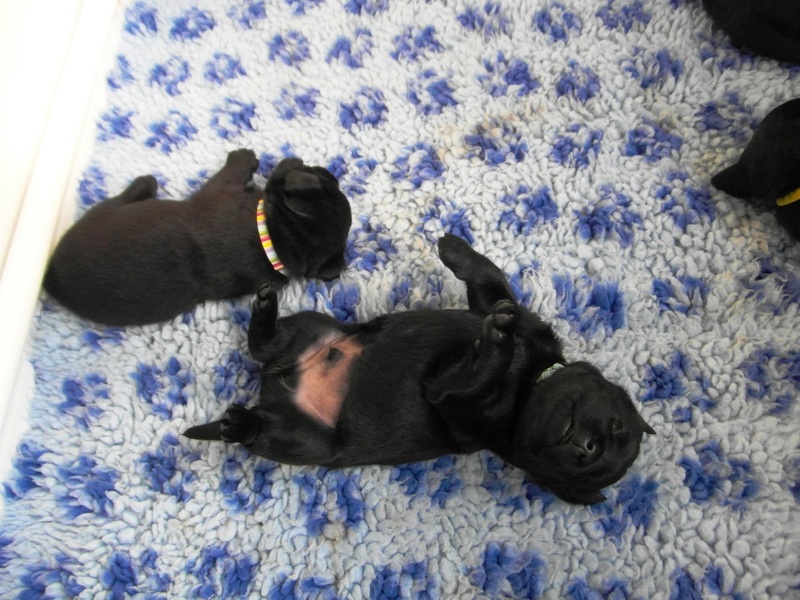 The puppies have it timed to perfection, they lull me into a false sense of security, thinking they've all done, then the second I put clean bedding down they start all over again. 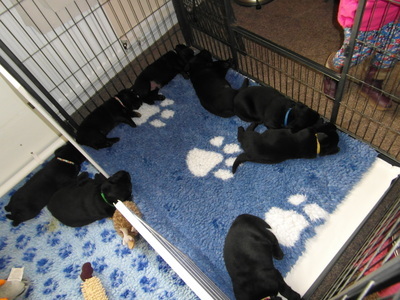 Today they've excelled themselves and I actually got to the point where they had the last two clean pieces in their pen and the rest was either on the washing line, in the washing machines or waiting to be washed. 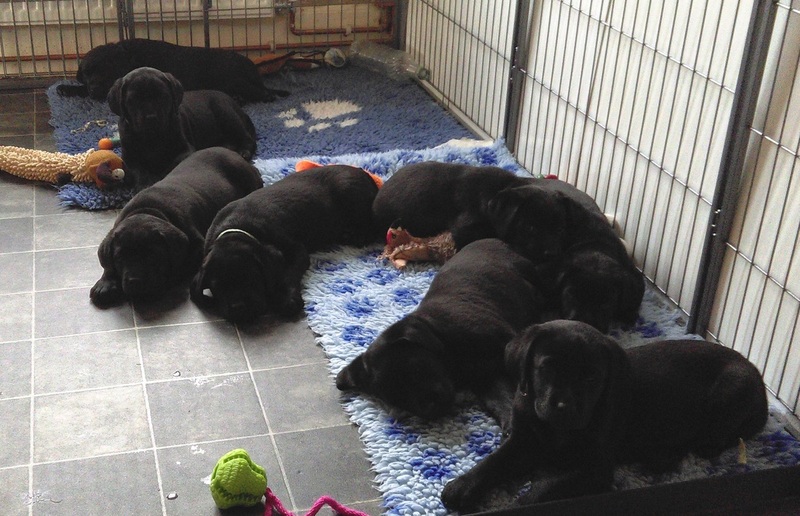 If it was an Olympic sport this litter would get the gold medal every time! 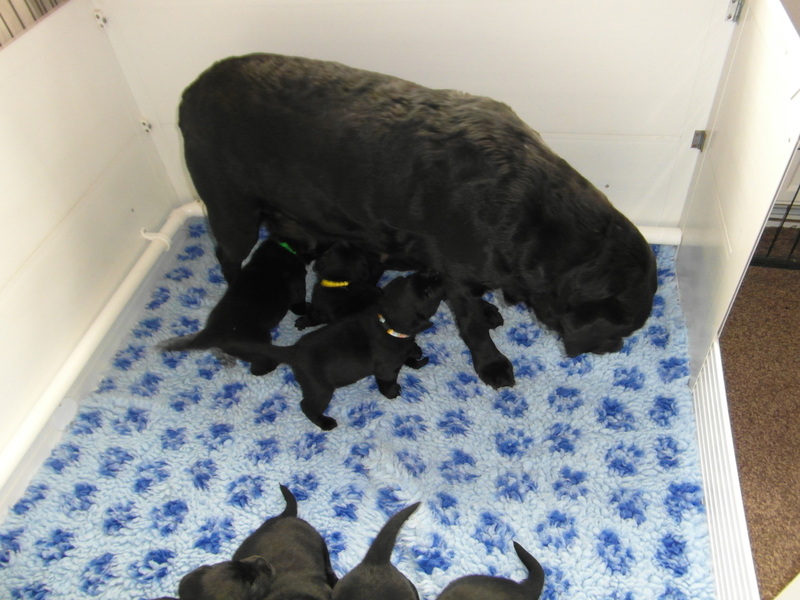 The adult dogs have been keen to go in with the puppies. 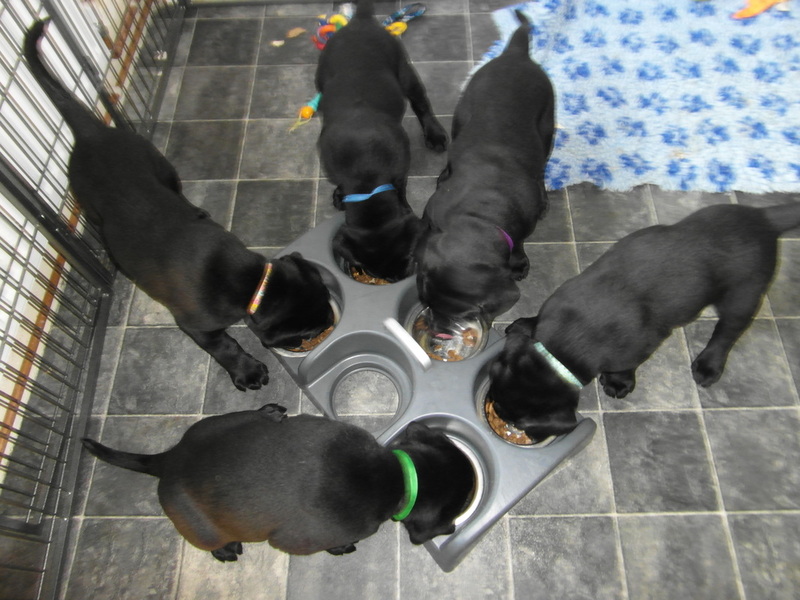 There's barely enough room around the bowl now the puppies have grown, they're ready for individual bowls rather than one shared one. 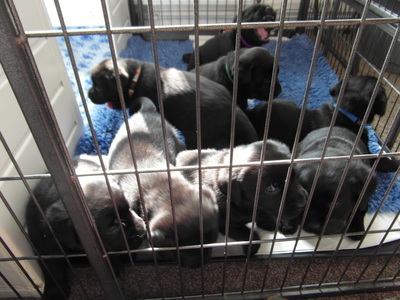 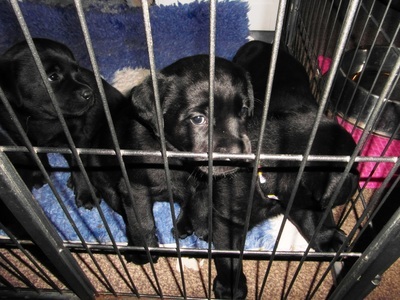 The puppies are now in the dining room where they can have a bit more space. ​In the first photo they've re-arranged the paper and managed to completely cover one puppy. 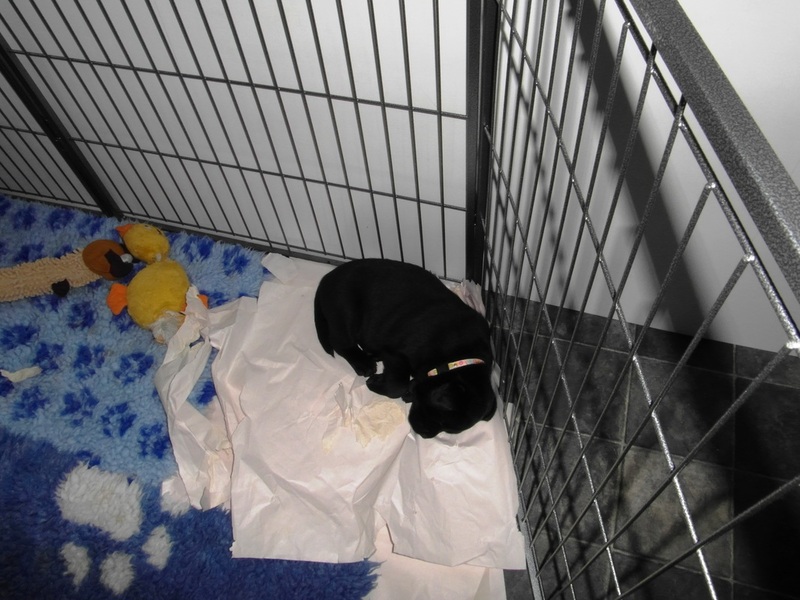 This girl has re-arranged the paper to make a nice comfortable sleeping corner. 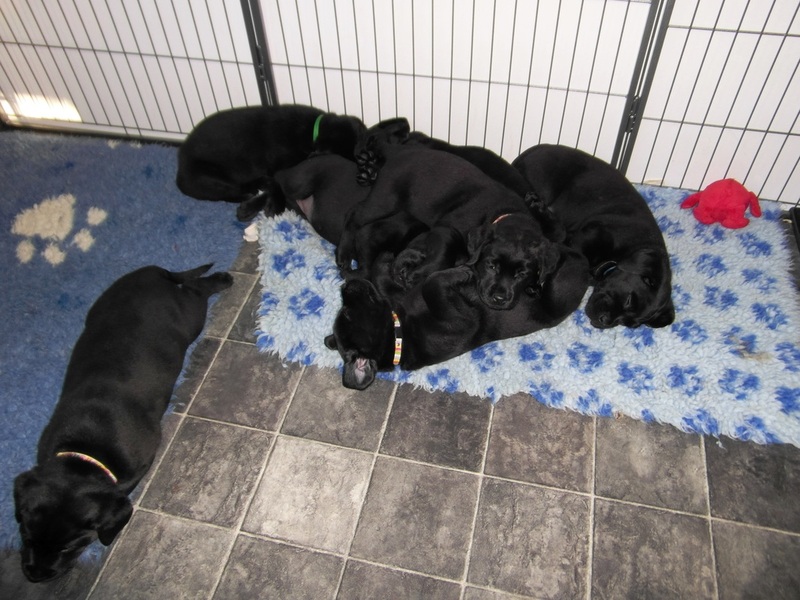 The puppies have got all of the pen to choose from but ended up in a heap at one end. 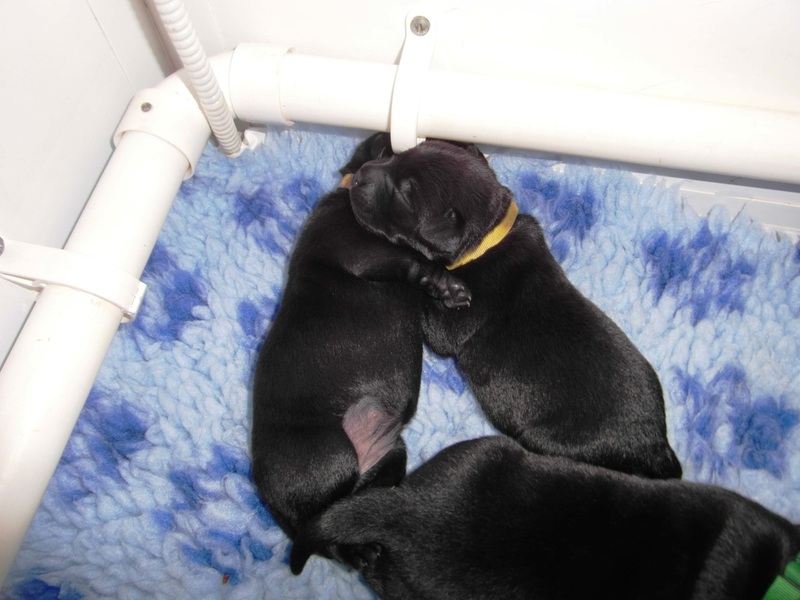 One of the girls giving her brother a cuddle. 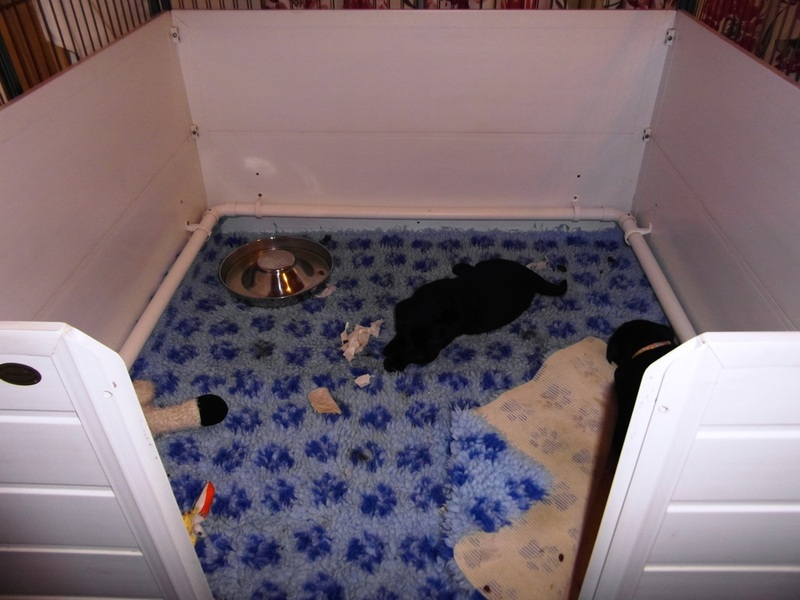 The puppies have a new toy, it's really a cat play frame but I've adapted it and added puppy toys. 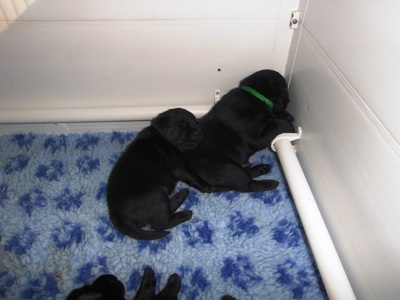 Watch a couple of them trying it out, in this VIDEO. It's been another busy day for me and the puppies. 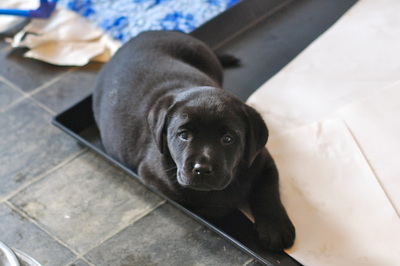 The second of the girls has been chosen, a difficult choice for her new owners. The puppies have also been weighed and wormed again. 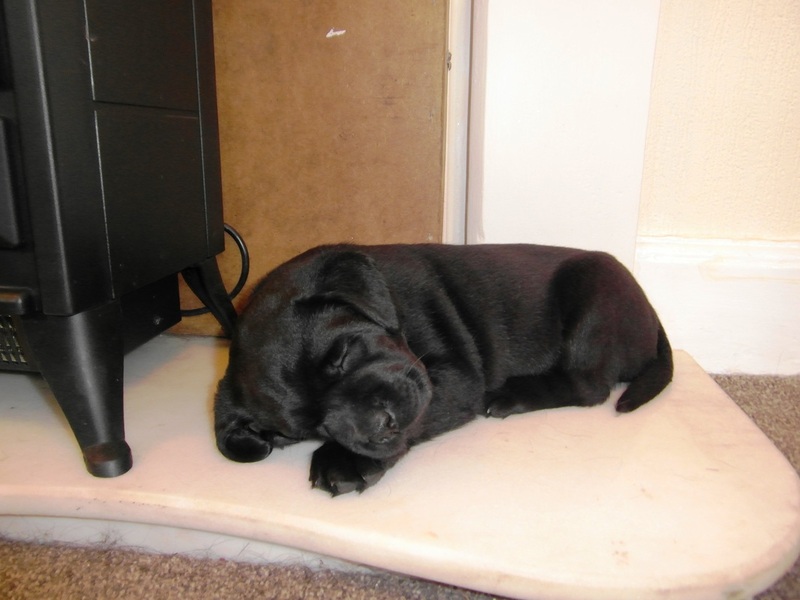 The only photo I got the chance to take was the one below, one of the girls asleep on the nice cool hearth. The girls had another busy day when more new owners came to make their choices. 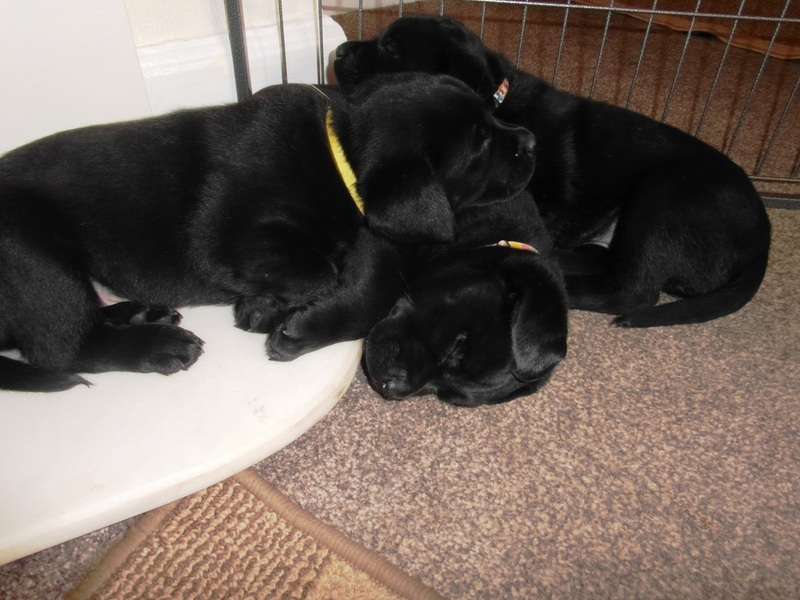 The hearth is a very popular place for them to sleep. 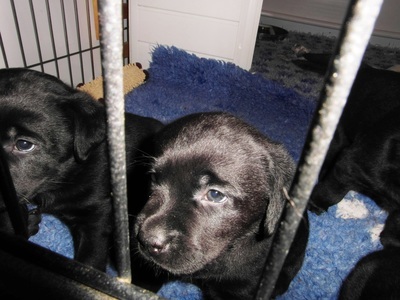 No holds barred where the puppies are concerned, all visitors are fair game. 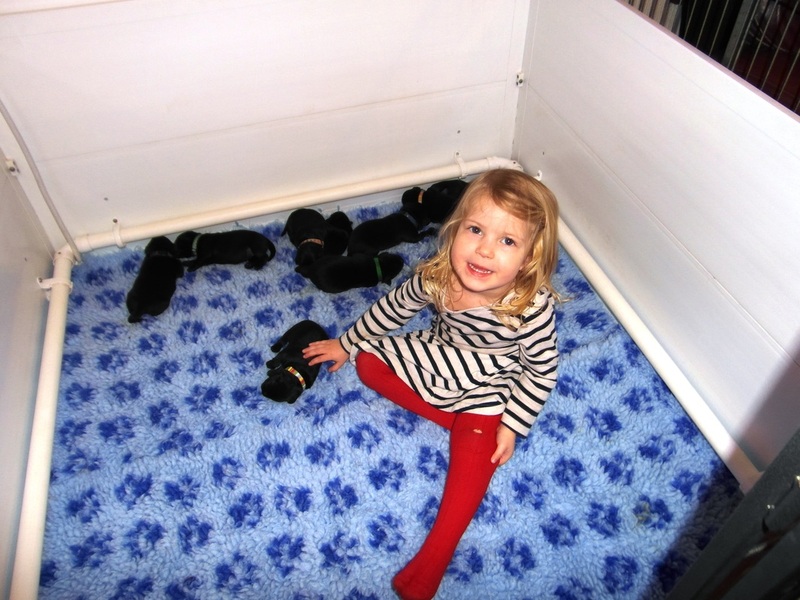 Watch this VIDEO to see what happens when my friend, Claire, gets in the pen with them. Below are just a few of the fantastic photos Claire took during her visit. 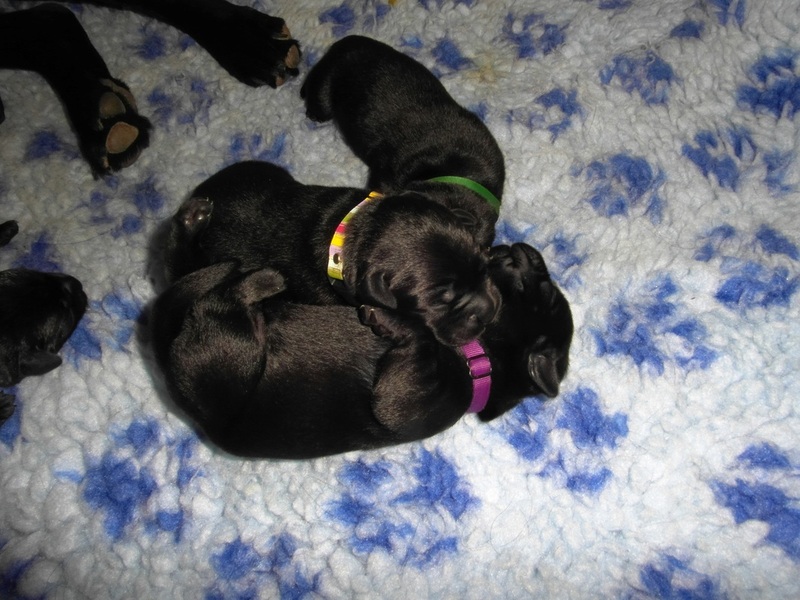 Click on each photo to view the larger image. 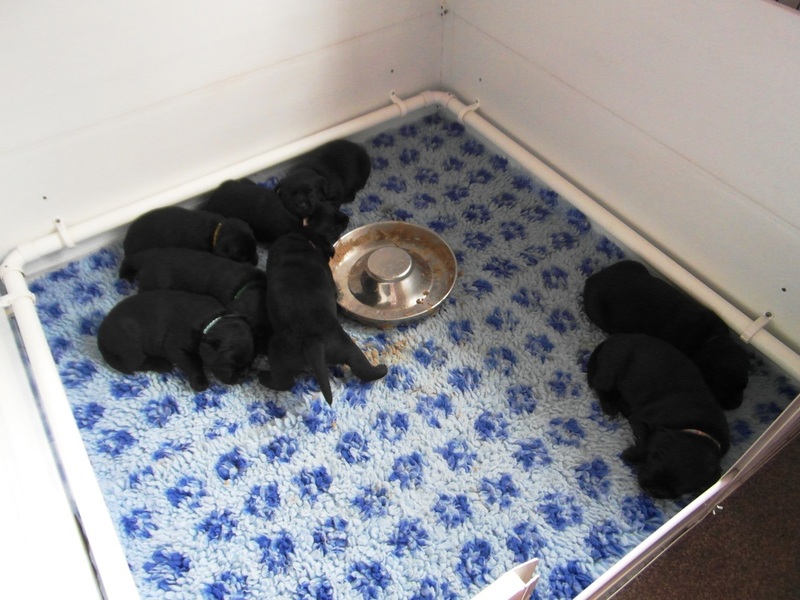 The puppies have grown so much in the past weeks and when you look at the photo below and compare it with some of the first ones of them eating solid food, you can see the difference. The puppies have been out in the car today, visiting quite a few places. 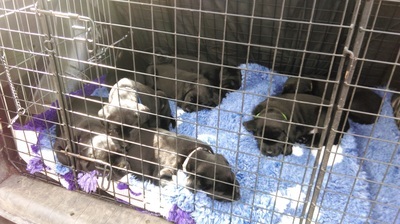 They were quite content and hardly made a sound once the car was moving. The puppies snuggling up together for a nap. 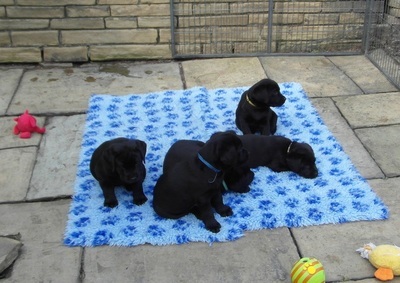 The puppies have been outside today. Esther sneaked into the pen, hoping to find some remnants of food, instead she was chased around the pen by the puppies. Watch what happened in this VIDEO. The puppies have been outside again today, but unfortunately, to coin a phrase, rain stopped play. 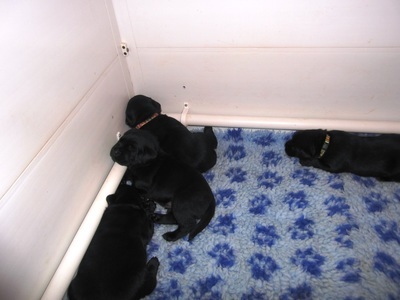 You can see them playing in this VIDEO then snoozing once they're back inside, in the photo below. 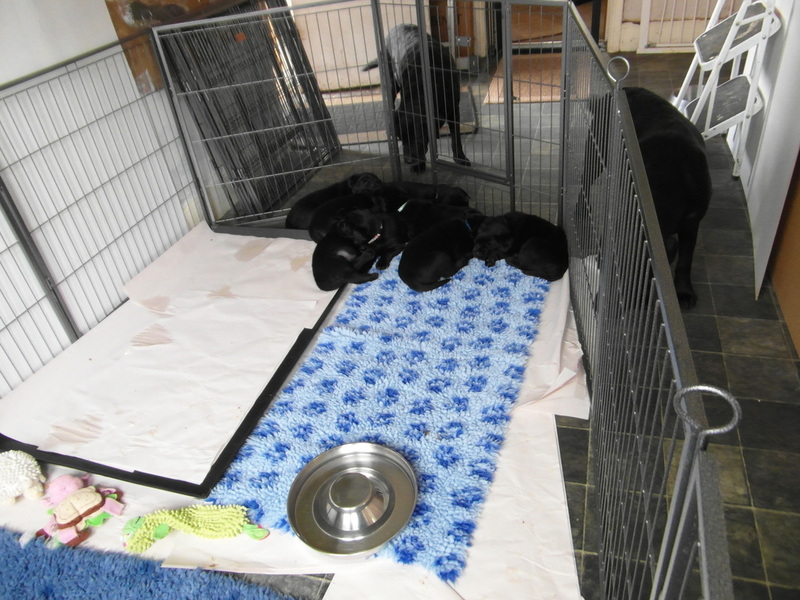 Yesterday was a cold damp day so the puppies couldn't go outside. 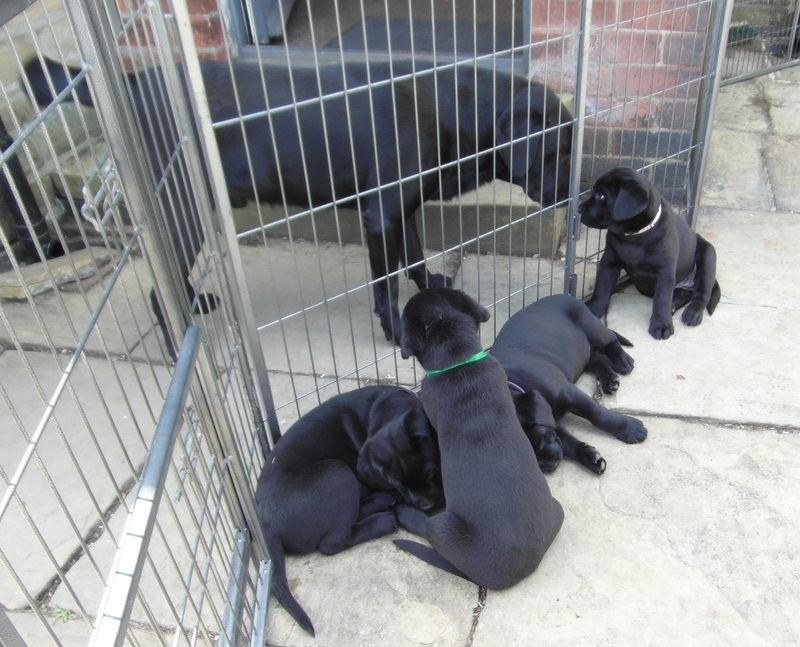 Today has been completely different and they've been outside for much of the day. 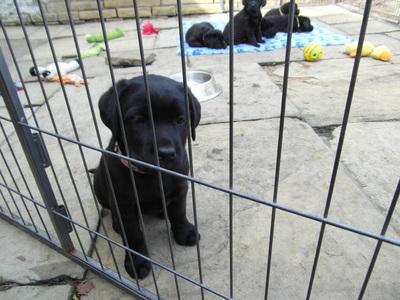 Here's another VIDEO of them outside, with Esther joining them to play, as well as a few photos. 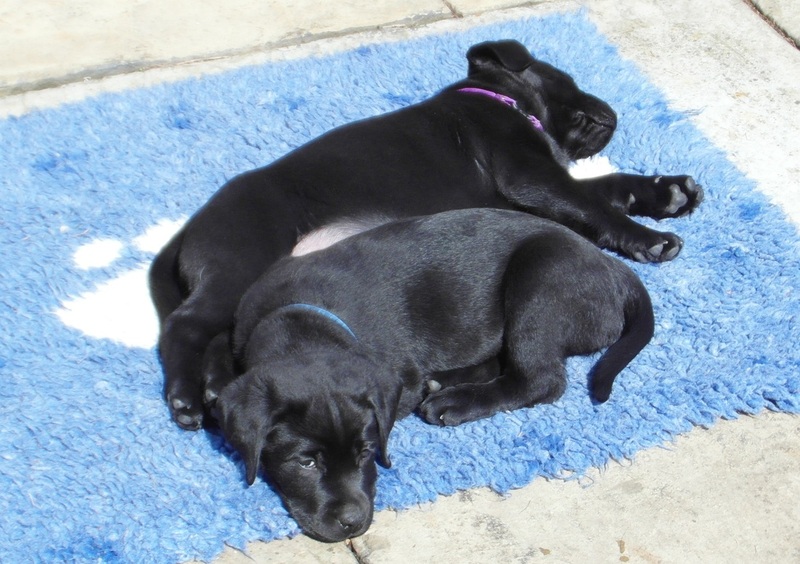 The puppies spent a few hours outside this afternoon. 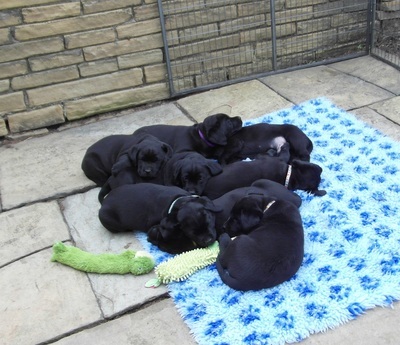 This photo was taken when they were back inside and settling down for a nap. 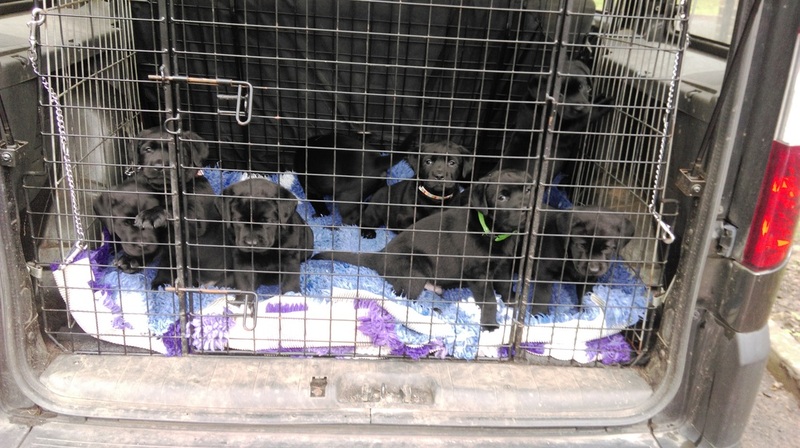 In the car ready to set off. 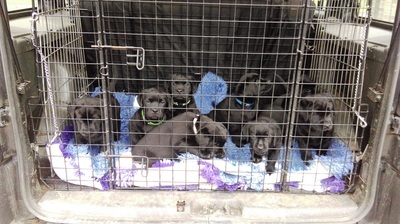 Back in the car for the journey home. 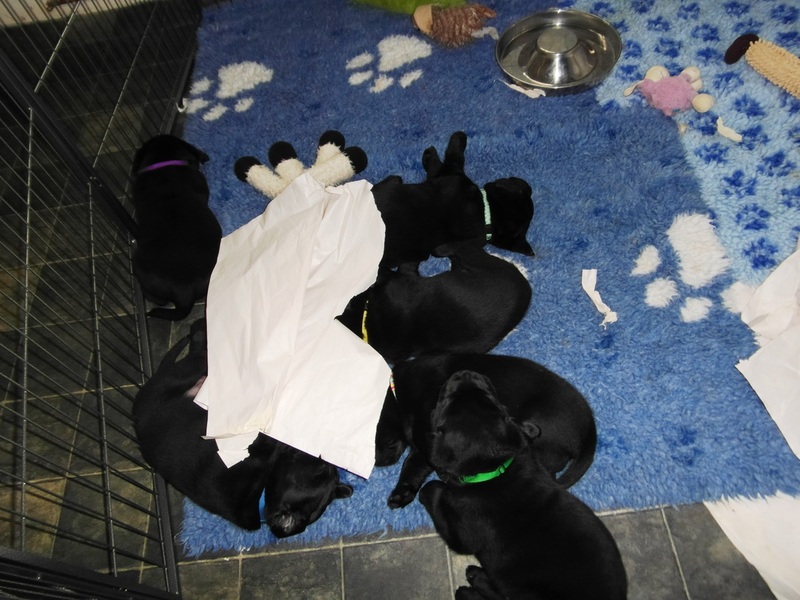 Note the different bedding,they covered the first layer in poo on the journey there! The first 3 puppies left for their new homes today. It's always an emotional time. I try to pick the very best of new homes for my puppies but it's still a wrench when they leave. 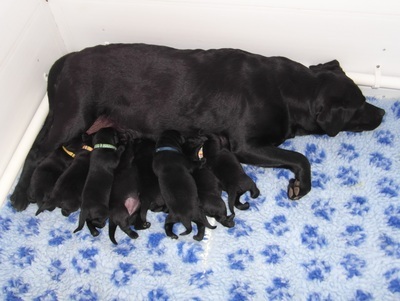 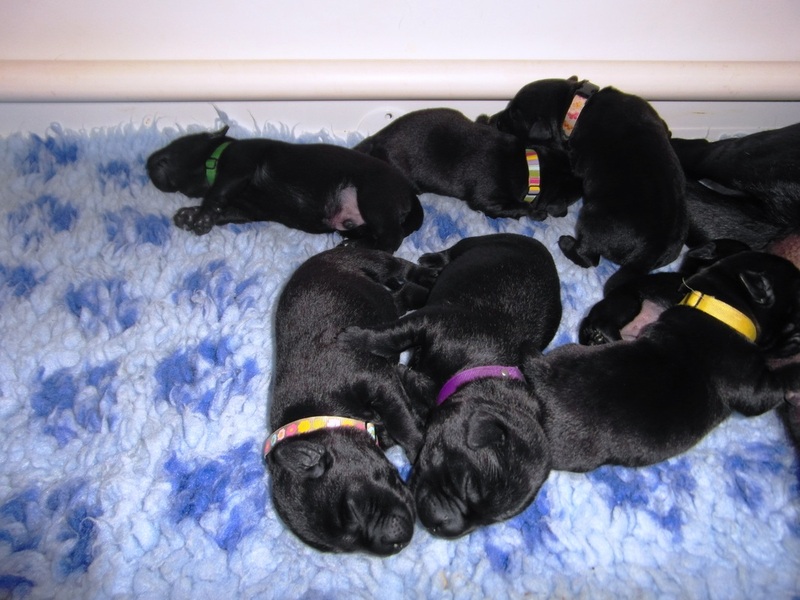 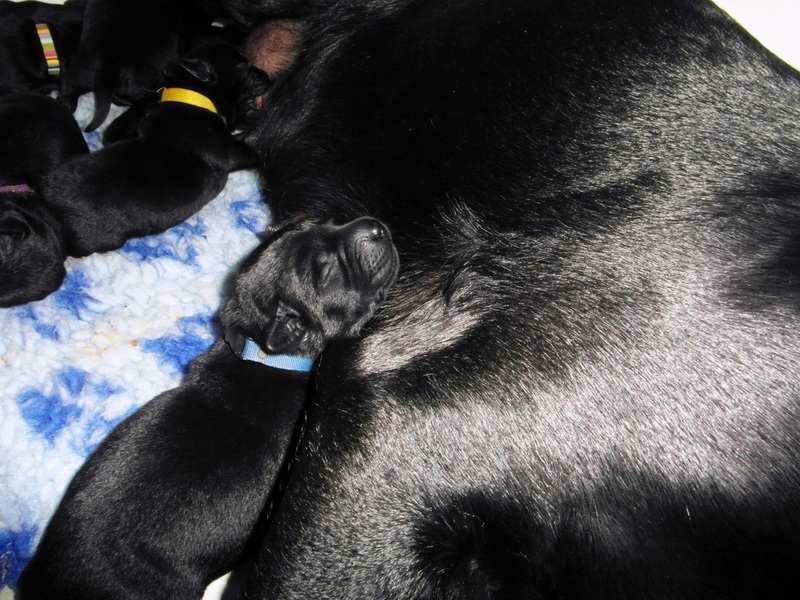 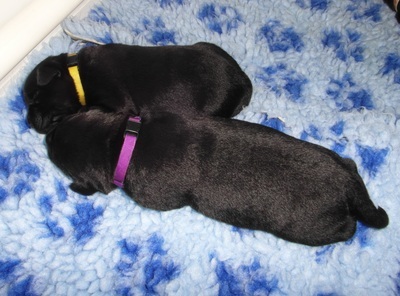 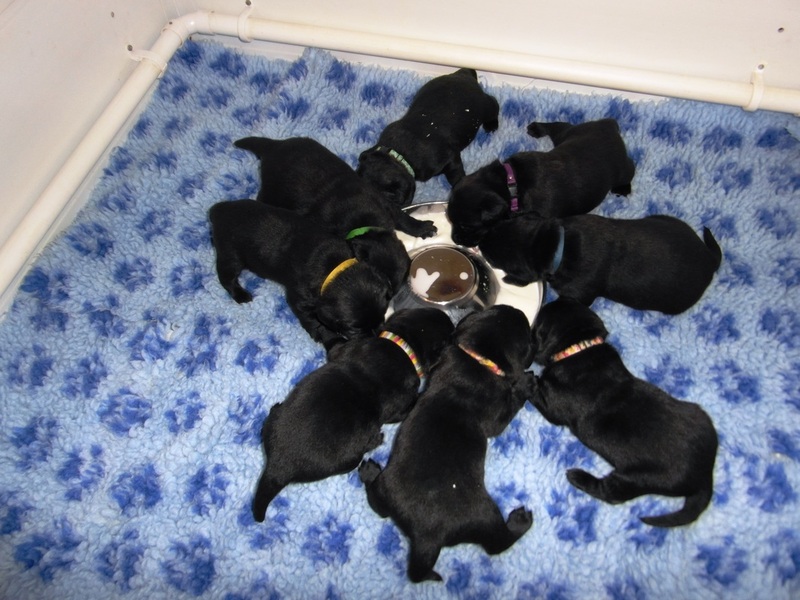 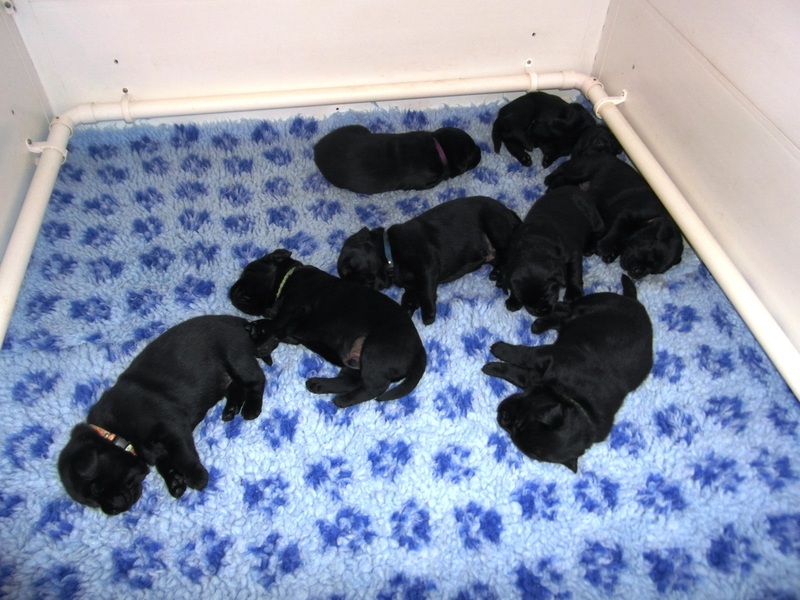 You can follow their progress on the 'More of Gertie's puppies 2016' page. 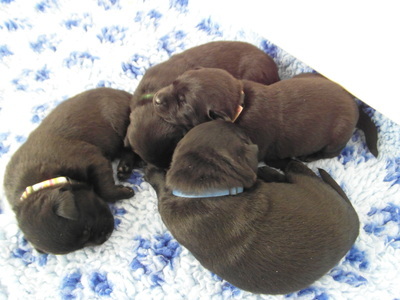 And then there were five. 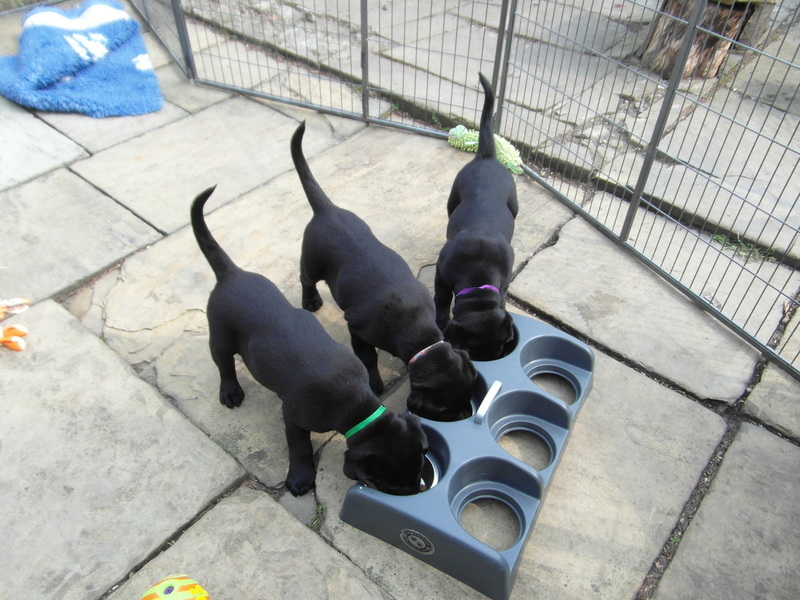 Indy, Sam, Miriam and Betty tucking into their tea. 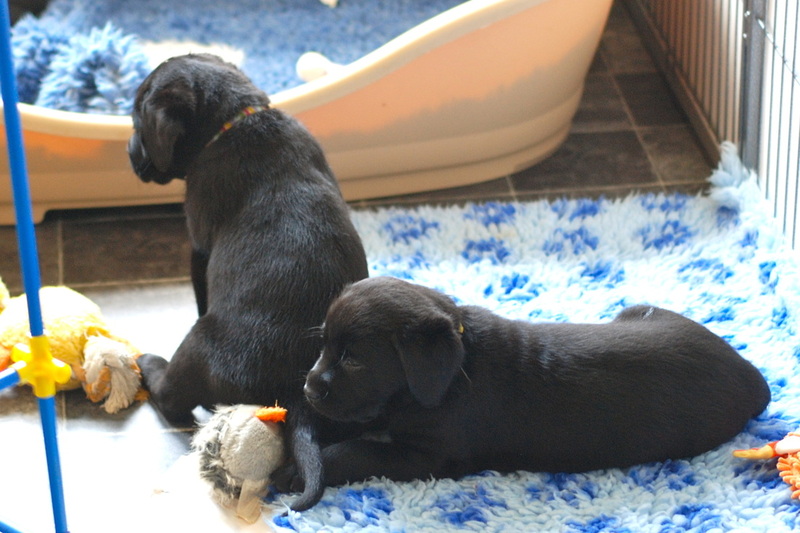 Partners in crime, Miriam and Robbie. 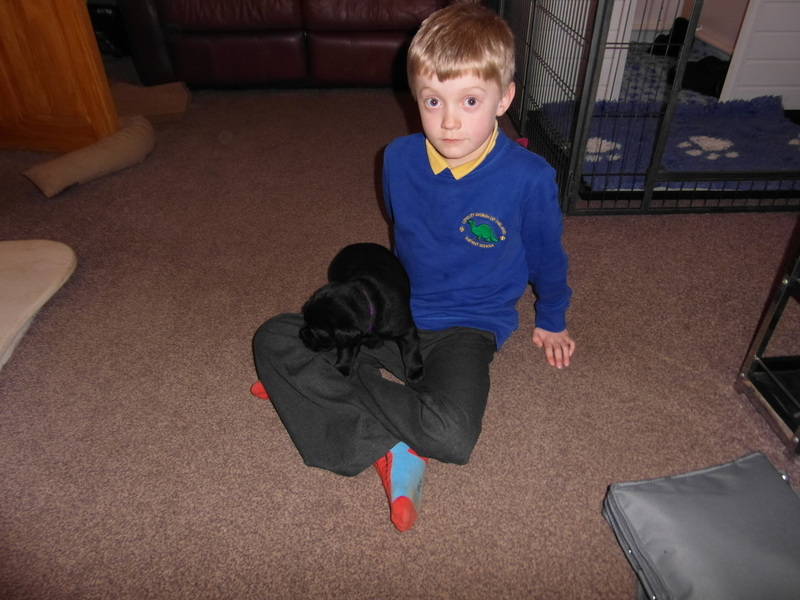 These 2 are best buddies. 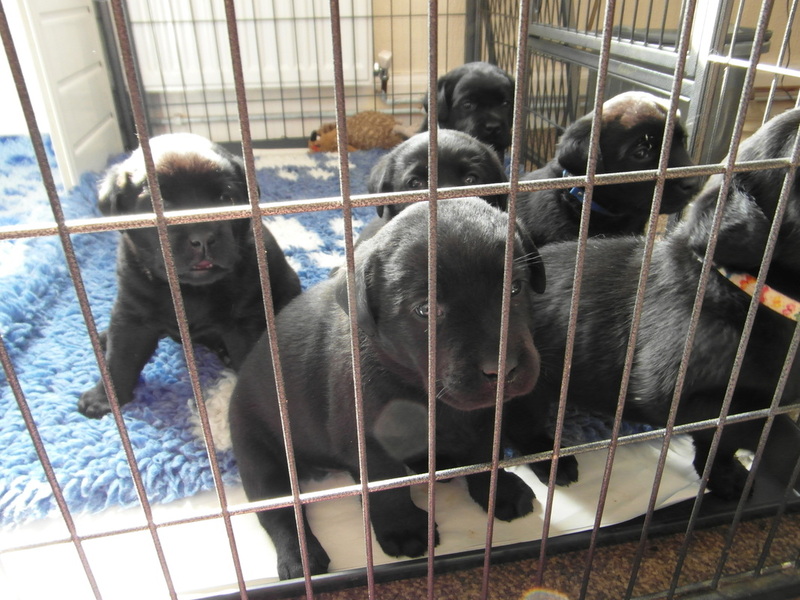 All 4 remaining puppies, with Uncle Ned at the other side of the pen. 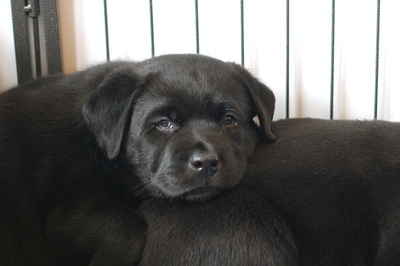 I love the relationship between the puppies and the older dogs. 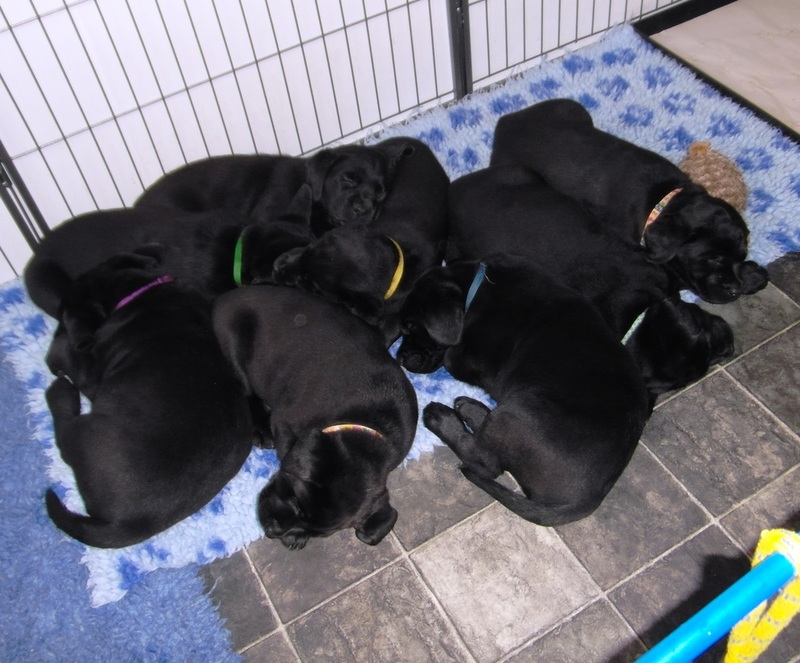 In the FIRST VIDEO you can see Esther, Annie and Gertie playing with the puppies, as well as Indy, the boy with the green collar, giving granny Martha kisses. In the SECOND VIDEO great granny Poppy wants to join in but has to make do with Indy saying hello to her. 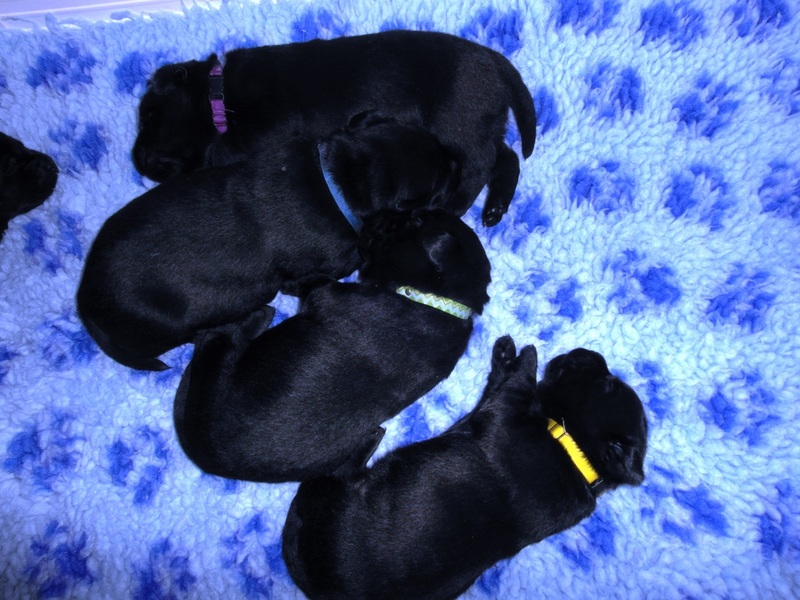 And then there were three. 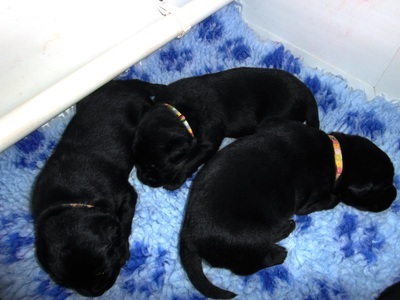 It's just Indy, Betty and Miriam now. They've substituted the fox toy for their brother. The last of the puppies has gone to her new home and now it's just me and Miriam (and the other 11 <grin>) Don't forget you can follow the puppies' progress on the 'More of Gertie's puppies 2016' page.